I started where I left off and initially walked through Inverlael Forest. It was Saturday morning so there were a few day walkers about, no doubt bagging some nearby munros. I met a couple of chaps who went bounding off down the path and I thought that the direction they were going was a bit odd unless they had the LEJOG guidebook. 10mins later they came back waving their arms shouting “it’s a dead end, turn around”. I said “I know but I’m turning off here” and it transpired that they were already lost. They had a chaotic air about them and I never saw them reappear where they should’ve done. I wonder if they ever got up the hills! As I was not at full strength I decided to have a longer day but on easier terrain as opposed to a long pathless section. Once up out of the forest I was on a broad plateau and had 4km of bog to negotiate. The River Douchary came into view and just beyond it the track that I could follow all the way down Strathmulzie, past Corriemulzie lodge and onwards to the Schoolhouse bothy. My new boots were feeling good and were holding up much better against the bog than the old pair. I tested them against the river and they passed with flying colours! It was a warm and mostly sunny day and generally just enough breeze to keep the midges at bay – perfect walking weather. 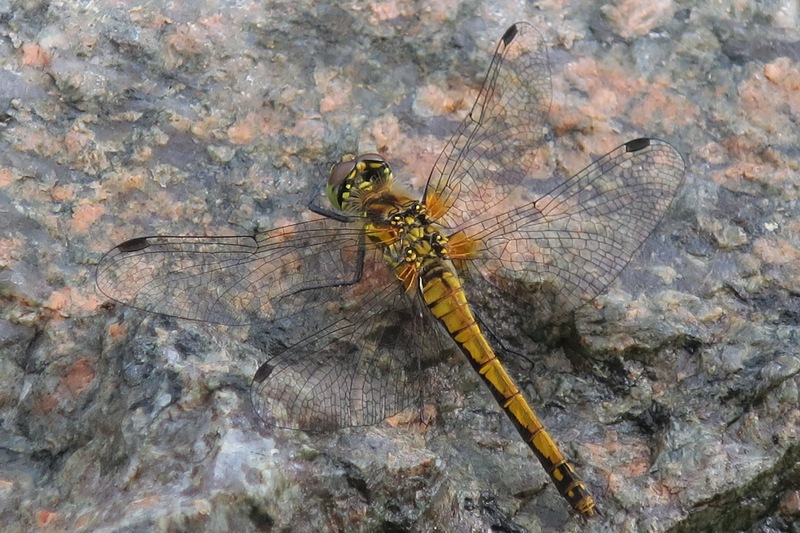 Must also have been perfect dragonfly weather as there were so many flying about. Other than that it was an uneventful day, which is just what I needed. I met a couple of fisherman nearby the lodge who were captivated by my story and said that I should stroll into the lodge and demand a dram of whiskey or a cup of tea at least. I decided to take it in jest and head on to the bothy, I would need all the rest I could get. The bothy was lovely, it was in fact a schoolhouse in the 1870s and was fully refurbished about 10 years ago. It is an iron clad structure with wooden cladding inside, and large windows. 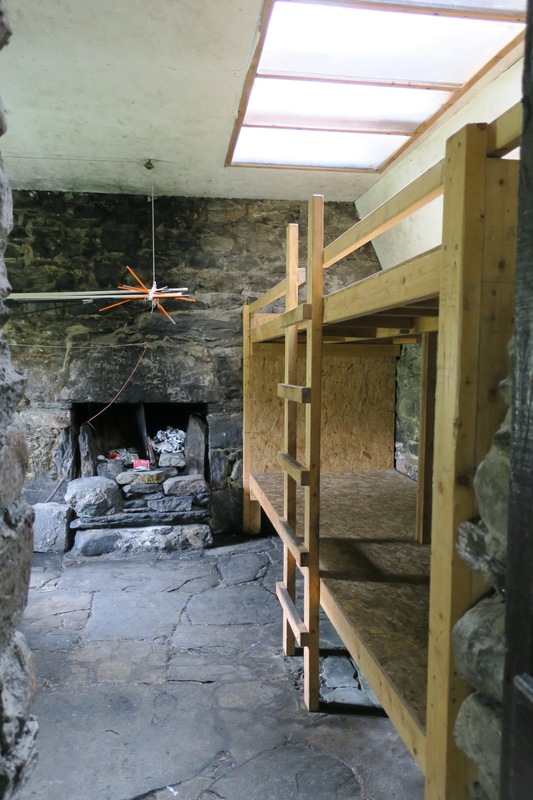 It was the biggest, brightest, cleanest and most interesting bothy I’ve stayed in. One room even has a couple of old school desks, a blackboard and a selection of academic books. 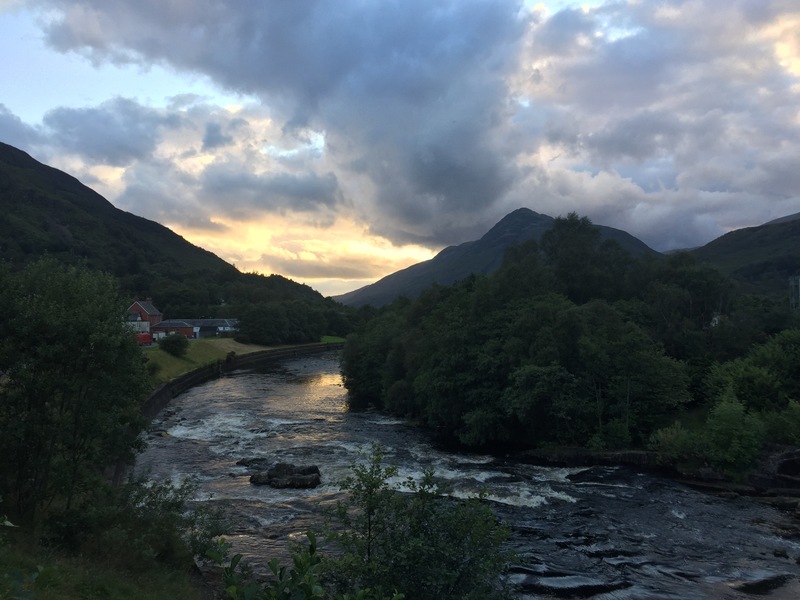 It was a lovely sunny evening so I headed down to the river for a refreshing swim and wash.
Today was extra short due to my decision making yesterday, and was pretty dull – just 4 miles along a forest track to Oykel Bridge. The interesting part of the day – after I had removed 8 ticks(!) – was the afternoon, as it turns out Sunday is changeover day for the gentlemen who come to fish the rivers. During the early afternoon the hotel had been so quiet you could hear a pin drop and then suddenly at 5pm it erupted into a hive of activity. Weary guests (most having traveled up from southern England) were streaming in with gear aplenty; most of it bound for the rod room. 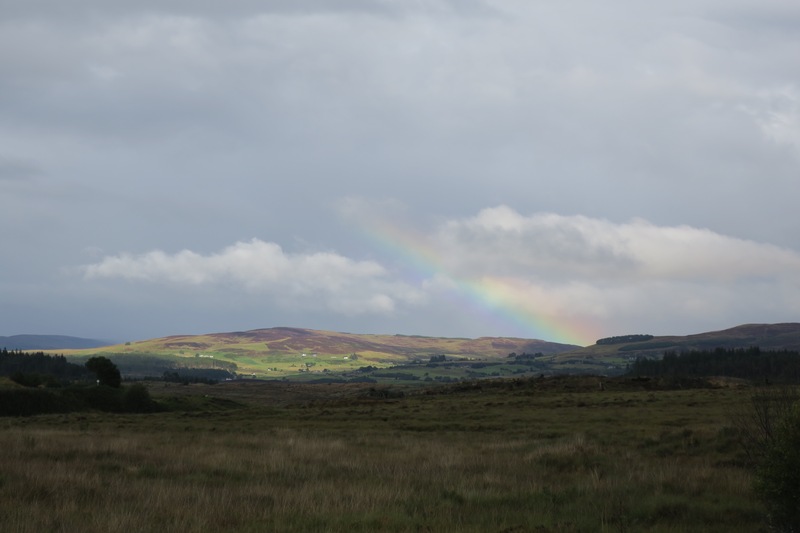 I had just landed into a world I know nothing about – Scottish estate salmon fishing. Everything I now know about this topic I learnt from overhearing the conversations that proceeded over the next couple of hours in the hotel bar. Including the classic anecdote; ‘the fish was this big’ said with hands held wide apart in front of them. I was captivated. News quickly spread through the group about my presence and I had to be restrained at the offer of drinks. I had already learnt that beer won’t fix my upset tummy. I waved goodbye to the fishermen who were setting off at the same time and the walk today started along the River Oykel. It was pleasant walking but showery overhead. Further on down the river a fishermen (not one I recognised) came striding towards me from about 200yards to accost me. He firstly assumed that I was heading up the wrong valley, which put my back up. “Are you looking for Corriemulzie? It’s not down here.” “No I’m not” I replied, “I’m heading to Rosehall”. “Ah well you can’t get there down this side of the river.” “I know, I’m planning to cross at the bridge and continue”. He then rambled on about how I couldn’t go the way that I had described but I didn’t follow him and looking at the map, I didn’t think he was right, so I cracked on ignoring his advice and lo behold it was fine! When the rain really came down luckily there was a barn with an open door so I popped in and took shelter while it passed. Then it was out onto the road for the rest of the day via a brief rest at the hotel bar in Rosehall. The afternoon brought some strong winds and rain as I trudged over the pass and 8miles later the outskirts of Lairg finally came into view. I checked into the B&B, showered and then had a craving for fresh fruit. Satisfied with an orange and nectarine for pudding I went to bed. 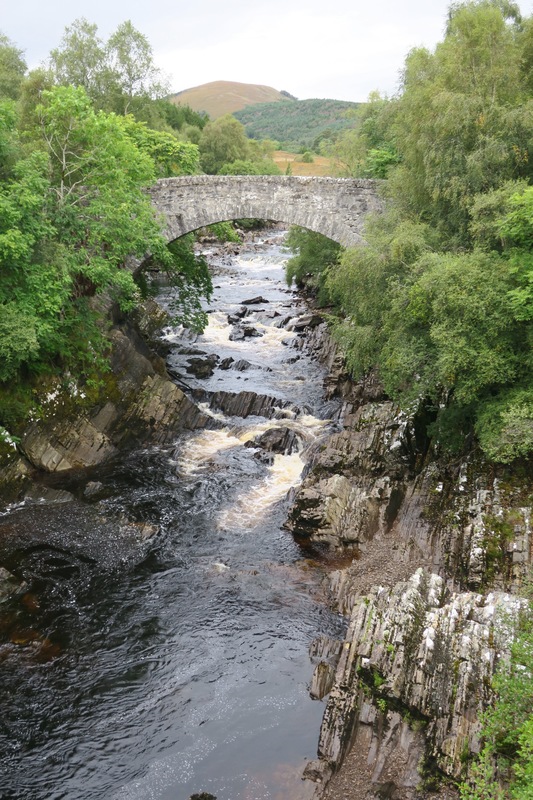 I took a planned rest day in Lairg to pick up my next food parcel and secondly as I was still suffering with a rotten gut and one of my tick bites had come up in a rash I decided to head to the doctor. He thought it was a prolonged case of gastroenteritis and furnished me with antibiotics for potential Lyme disease. Had a fine night in the bothy – I didn’t really expect to sleep that well, I think it’s the idea that someone or anyone could turn up at any moment which put me on edge a little. The midges were pretty prevalent again in the morning so I didn’t venture out until I’d had breakfast and packed up. The previous evening I’d easily forded the stream outside the bothy but there must’ve been overnight rain because I couldn’t find an easy way back across. The River Ling lay just in front of the bothy too and that would have to be waded so I rolled up my trousers, put my sandals on and tied my boots to my bag. Firstly I waded the stream, then the 200m of bog, then over the river. It was fairly deep and fast on the far bank but I got across ok. There was a vague path leading up over the shoulder of Ben Dronaig which petered out but the direction of travel was obvious enough and then I picked up the path leading along the side of Loch Calavie where the rapidly moving clouds caused the sunshine to dance off the hillsides and water. 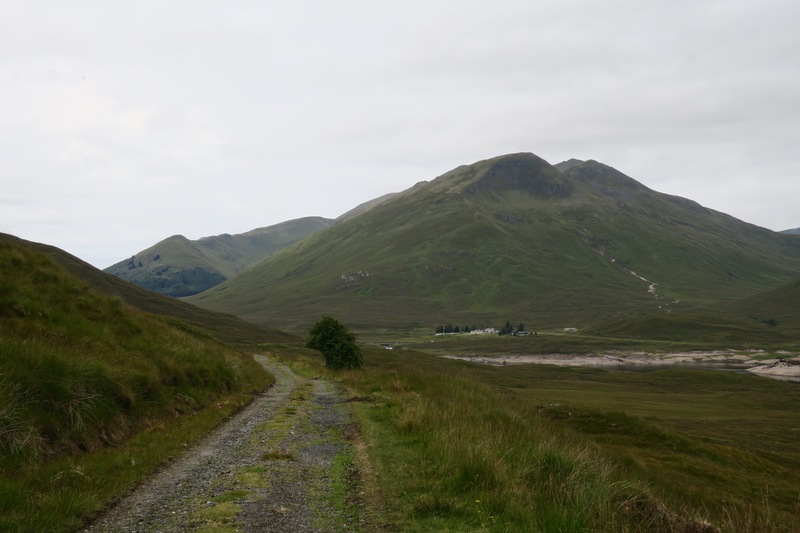 I started to descend on Bendronaig Lodge whose setting had been changed somewhat by a considerable hydro electric project – I could see traffic (4 vehicles) to-ing and fro-ing up and down a track ahead. People! 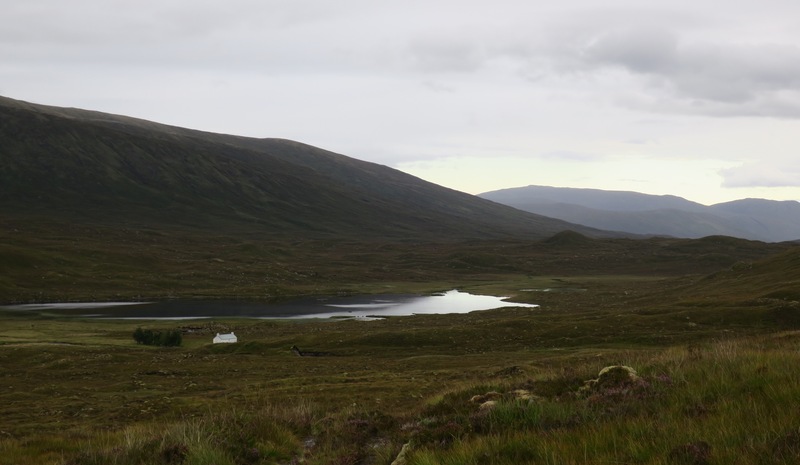 There is a bothy at the lodge but it was about 1/2km off route so I just observed it from afar and noted it for future reference. I progressed up the track and took a look at my route ahead, I stopped for lunch and the cloud rolled in hiding my destination but by the time I’d finished it was in view again. 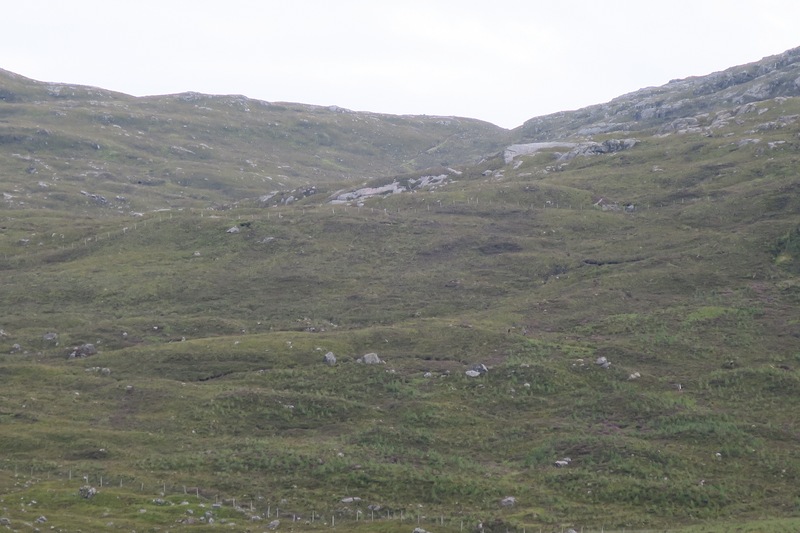 It was a tough pathless climb up over the bealach and I was relieved to reach the path leading down the other side. I even saw a few deer up on the hillside – there aren’t as many about as I thought there’d be. Perhaps they smell me coming from a mile away and scamper, I wouldn’t be surprised, I think I’ve acquired somewhat of an aroma on this trip, despite my best efforts. Once descended it was time for another river crossing, handily there was a bridge…if you can call 2 wires with a sign saying “Use this bridge at your own risk” a bridge. I gave it a waggle with one hand, ‘yup seems sound to me’. As if a waggle would be the equivalent to me and my bag, hah! Once upon the bottom wire there was the odd creak but I reassured myself that many heavier folk have no doubt scooted across ok. I gently shuffled across no problems but was relieved to be on the other side. I met a forest track and followed it all the way to Craig. The rain came down quite hard for the last mile and I turned up at the bunkhouse absolutely dripping wet but the drying room showed great promise. There was only one other guest, and with no TV or internet powerful enough to load Facebook we talked. He was an American guy called Roger from San Francisco who had decided to quit his job and cycle through Scotland. Although I think he’d had enough of the rain as the next destination on his list was Athens, which was basking in 35 degree heat – perhaps too hot for cycling? The drying room did its job, even my sodden boots were virtually dry, a feat that usually takes a day or 2. After Roger had left, I had a slightly odd exchange with the warden which made me feel a tad uncomfortable so I quickly packed up and left. I was looking forward to getting to Kinlochewe as it was the first milestone of the last leg. 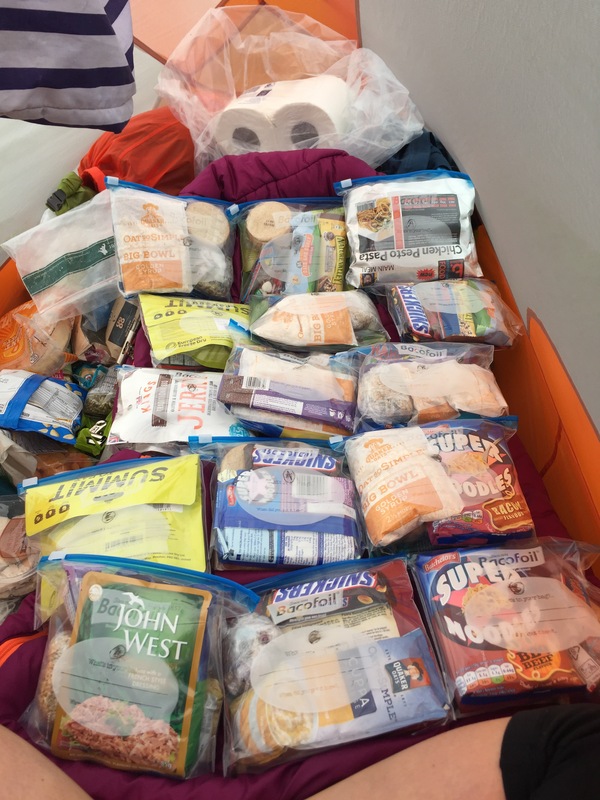 I had a food parcel to collect from the post office, there was a hotel bar/restaurant, bunkhouse, a shop and a campsite. A metropolis and a planned rest day. The route from Craig heads along the Coulin Pass Old Pony Track reopened in 1998 for wayfarers like myself. 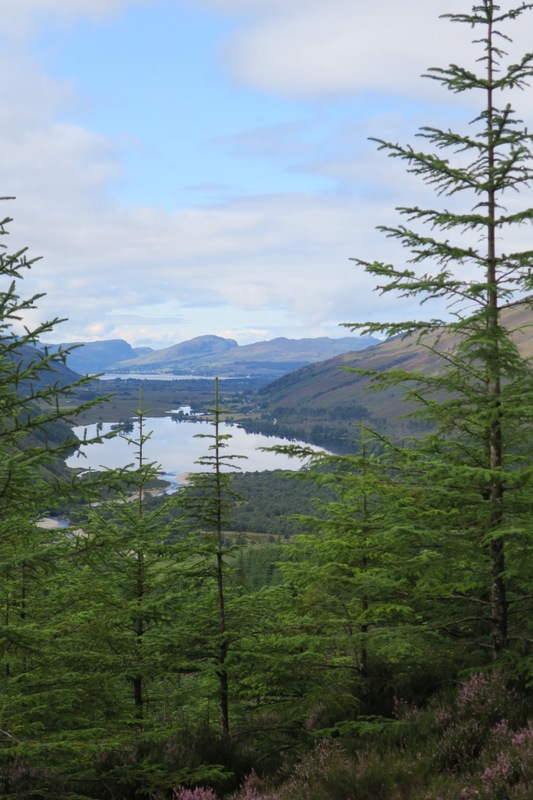 It initially ascends steeply though forest with great views down Strathcarron to Loch Carron and then meets a forest track which takes you over to Loch Coulin. 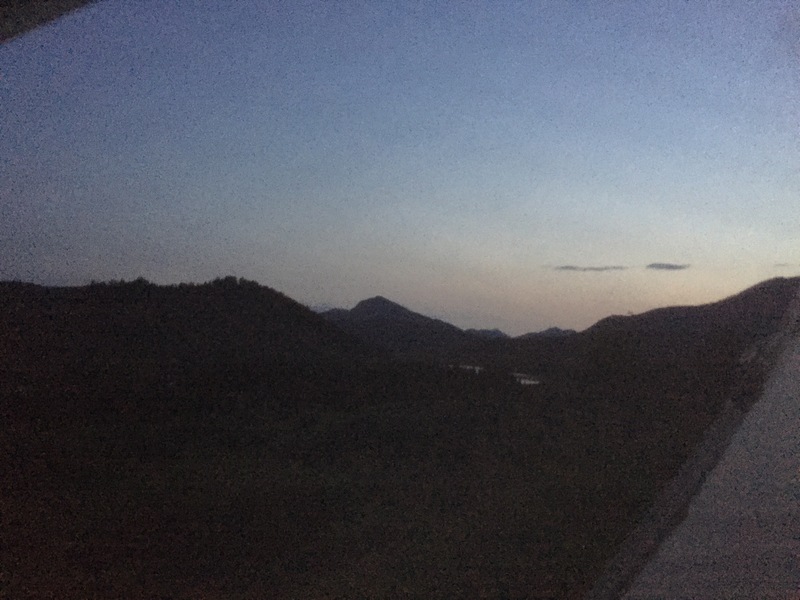 Again the landscape had been somewhat altered by the presence of heavy duty tracks and construction machinery building another 1 or 2 hydro plants. Looking beyond the building work, the surrounding peaks of Sgorr Ruadh, Liatach and the Ben Eighe range dominating the landscape. 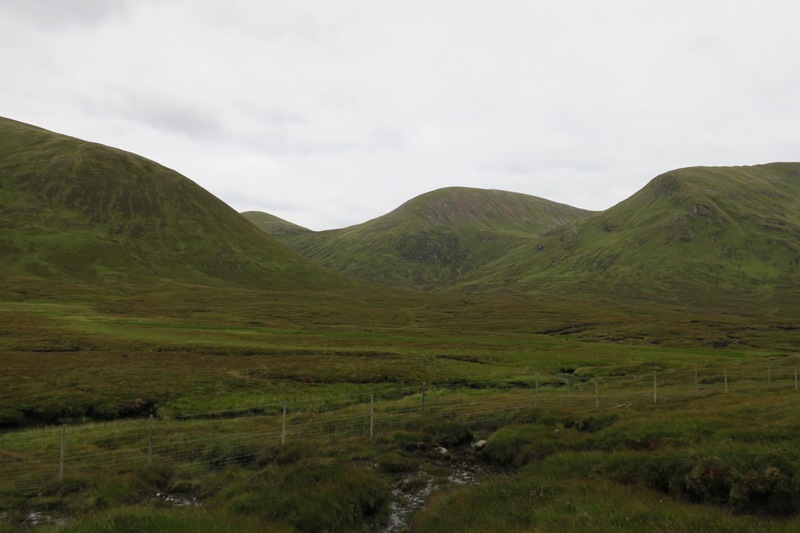 It was a fairly mundane trudge along tracks most of the way to Kinlochewe and I was glad to arrive. I’d been suffering from a dodgy stomach during the day and thought that beer would definitely help so went straight to the hotel bar. Unfortunately the attached bunkhouse was full for tonight, but I booked in for the night after, and took myself off to the campsite. After a day off spent mostly curled up in a ball in my tent – turns out beer (& gin) doesn’t fix an upset stomach – I checked into the bunkhouse and nursed a mint tea. Whilst I was there, a hillwalker came in, introduced himself as Andy Robinson at the bar and said he’d booked a bed in the bunkhouse. I looked down at my LEJOG guidebook just to double check but knew full well that the author was called Andy Robinson. Could it be the same one? He walked by my table, I caught his attention, pointed at my book and said “you’re not this Andy Robinson are you?”. I don’t remember his exact response but it was him and that evening we dined together in the bar. I complemented him on a well written and logical guidebook and he gave me tips for the section I was about to undertake – he’s in the process of doing a detailed revision of the guidebook and so is walking it in sections and making notes. Unfortunately he wouldn’t sign my copy, he didn’t make the exception for his mother so wasn’t about to do it for a stranger. It was weird because I felt like I knew him, his narrative had been the only constant through my old trip and yet he didn’t know me from Jane. Amongst all this, the bunkhouse had been overbooked by 2 beds but the proprietors had gotten to know us by now and offered us each a room in the hotel instead which we both jumped at. Unfortunately the hotel room hadn’t given me the restful night I’d hoped for – I still had a complaining tummy- but I was extra glad not to have been on the top of a 3 tier bunk in a dorm. 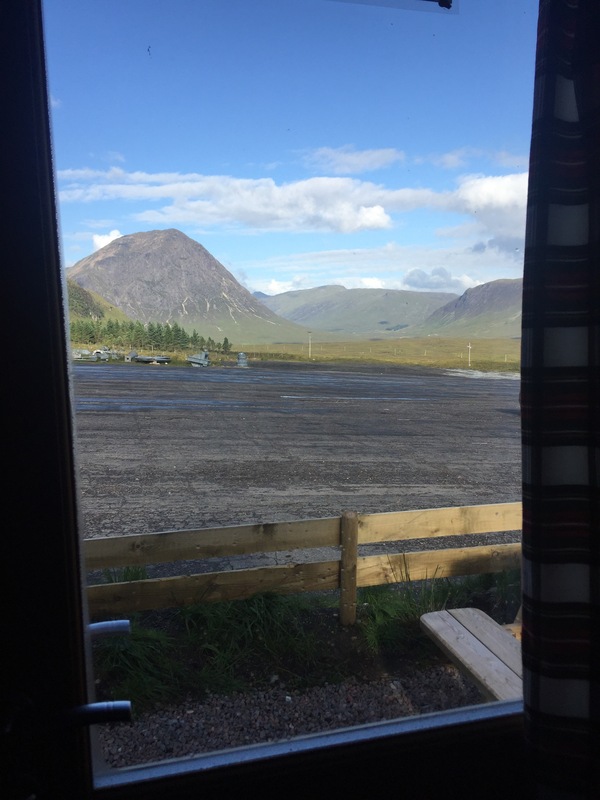 I reluctantly left Kinlochewe – I’d halfheartedly attempted to rearrange the accommodation I’d booked ahead and stay an extra night but neither the hotel/bunkhouse or future bookings could be made. To make matter worse it was a dreich morning – windy and damp. 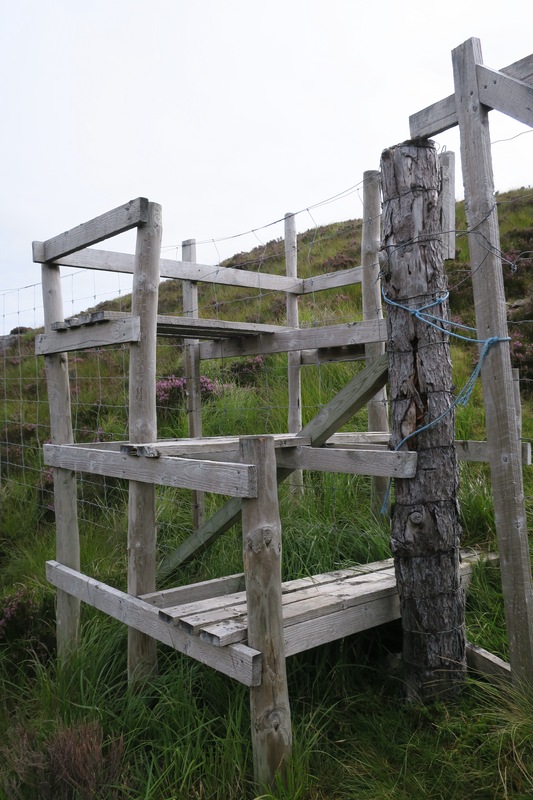 I headed on up to a place called Heights of Kinlochewe where I expected to find a bothy so I could get some respite from what was now proper rain but it was locked up and the neighbours (a holiday let I think) were no help. So off I trudged up the path alongside Abhainn Gleann na Muice. I started to feel weak having not had any breakfast or slept properly. 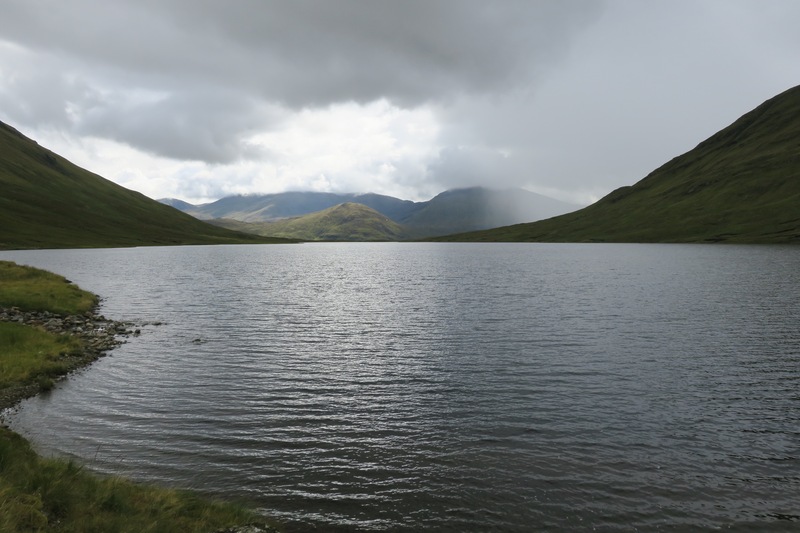 I rested often and eventually made it up to the bealach and descended to Lochan Fada. I stopped for a longer rest in the lea of a ruin, it was lunchtime but I didn’t have an appetite so forced down half a cereal bar. 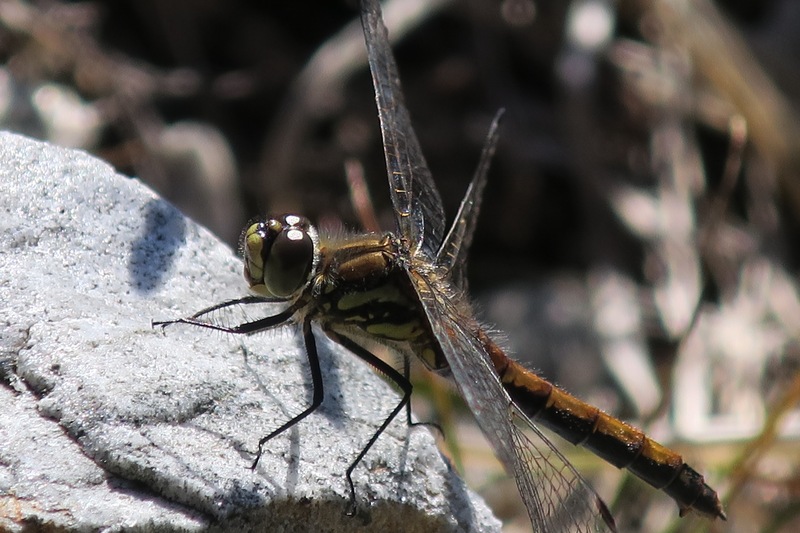 A dragonfly came a rested out of the wind too just by me which was a nice moment. From Lochan Fada I headed NE over a mostly pathless bealach. I began to descend and had a strange feeling about the way I was headed, I checked the map and realised that I had started to descend into the wrong valley. I was in a low mood, I’d barely eaten, was tired and now I was off track. Luckily not too much time had been wasted and I set off on the right bearing towards Loch an Nid. 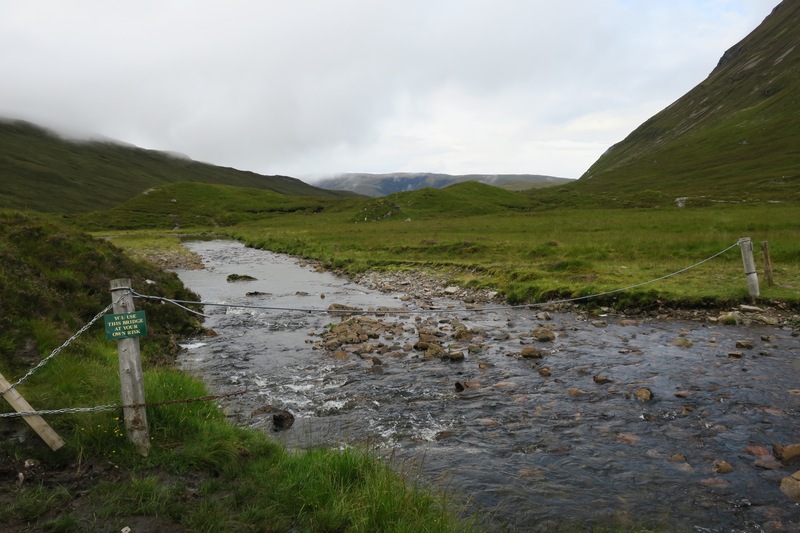 I opted for the ‘wet weather route’ which forsook the path and avoided a river crossing, and again started to descend…into another incorrect valley. Again I noticed my error early and corrected my course. The loch soon came into view and knew I was in the right place. Navigational errors like this had not happened on the trip thus far and had now happened twice in an afternoon, it had given me a slight scare, I wouldn’t want to have to retrace my steps all the way back up again, not in my current state. I shall endeavour to concentrate more. 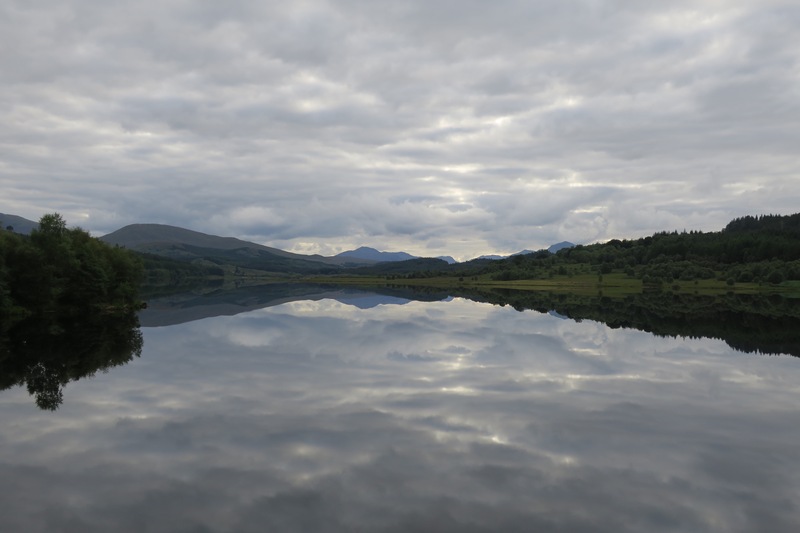 I got to Loch an Nid amidst showers but managed to pitch my tent in the dry on an area of grass more like a lawn – better than some campsites I’ve stayed at! The deer soon ran away and I had the valley to myself. The wind was picking up, but I was in no mood to find an alternative so decided to ride it out. I was exhausted and I lay for 4 hours shivering eventually drifting off however only briefly. At 10pm I woke in a cold clammy sweat still with no appetite and now a fever but I decided I must eat something hot. Had half my dinner and then tried to get back to sleep with strong gusts now trying to fold my tent in half. I had barely slept and had been ill early in the morning, perhaps I shouldn’t have eaten. It was such a shame, I was in a beautiful place but was consumed with illness and fatigue. Knowing that I was booked into a B&B at the end of the day is what made me pack up and continue. Needless to say the day was hard. I felt weak and exhausted but luckily it wasn’t navigationally challenging so I mostly just had to concentrate on putting one foot in front of the other. 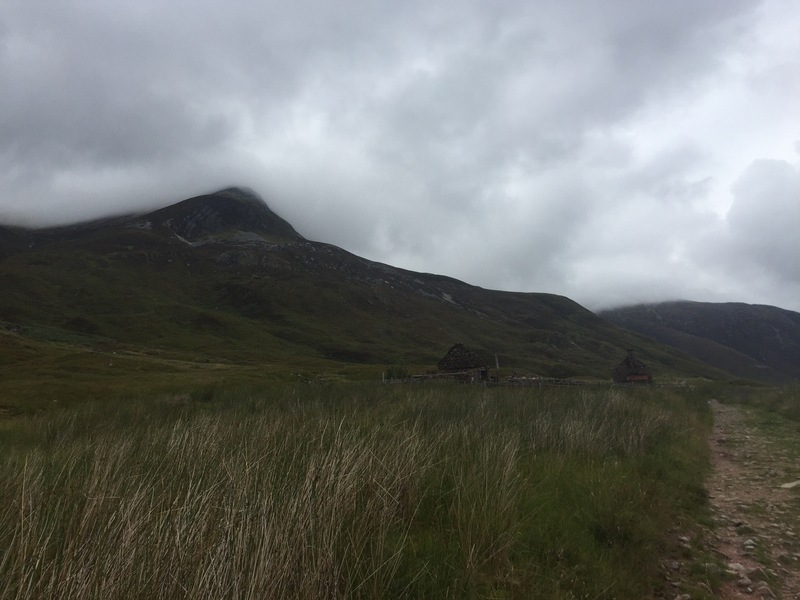 I rested often – at one point meeting a young Dutch couple who’d spent a couple of nights out at nearby bothies. Up and over one col to a road and just another up and over and I’d be able to recover at the B&B. At the road I met an estate worker who was keen for a chat, I explained my weariness and he was eager to help but we decided there wasn’t a lot he could do. I confirmed the route with him, he said it was easy enough to follow and to look out for an eagle that regularly inhabits the hill top. I dragged myself away knowing it would take longer than the 2hours he thought it should take to get to Inverlael. The ascent was brutal in my current state, I had no stamina and had to stop often on the way up. Most of these breaks were accompanied by loud expletives and tears. It had been hard anyway and now it had got a whole lot harder. I must admit that even when I’m in high spirits I find these landscapes bleak and lonely, so when I’m low, I find them even more bleak and even more lonely. Unfortunately there was no sign of the eagle but I did find a track that wasn’t in the guidebook but was on the map. It would take me a more direct but steeper route to my bed – it started just 200m from the path, so I negotiated the bog and found it. 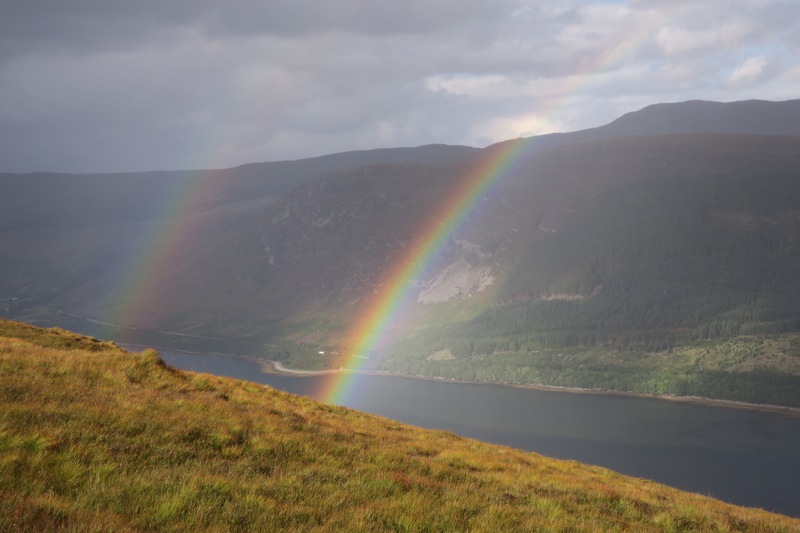 It was steep and rough but with the hamlet in sight I sped up a little going down and a double rainbow over Loch Broom greeted me to Inverlael. When I arrived the man was busy farming and the lady was out but she’d left me a note to say that I should let myself in and make myself at home, so that I did. I was soon unpacked, showered and feeling a little better. 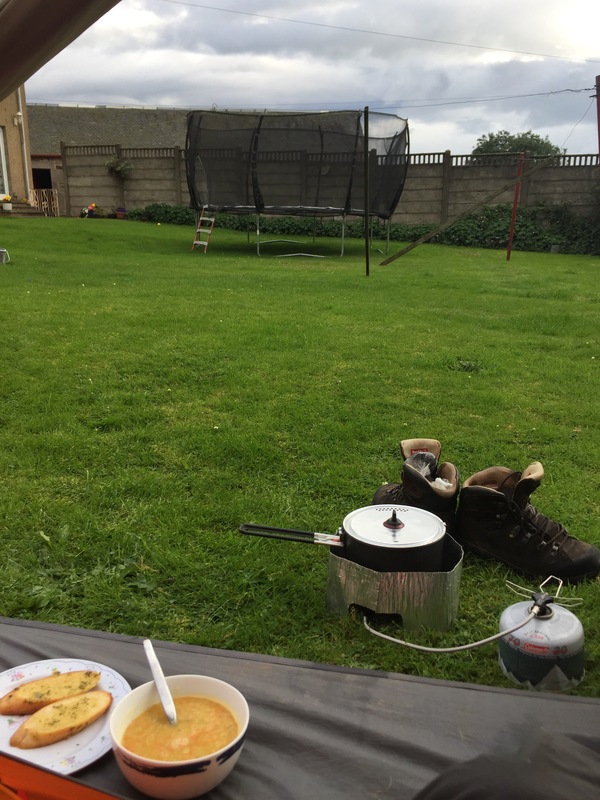 When Maree arrived she was lovely; she gave me a place to hang out my damp tent, hung my washing in the linen cupboard and offered me some dinner. I explained my ailment, politely declined and had some plain noodles instead. After a somewhat tearful phone call with my parents, they suggested that perhaps I needed to get better before continuing on. I had been so one track minded about keeping going that it hadn’t even occurred to me that Ullapool was just 6miles up the road. After a very disrupted night, I had booked myself into the youth hostel at Ullapool and Maree offered to take me. I arrived 6hours before you were supposed to check in but the warden was great, she let me in, let me bag a bed and once the room was clean she let me sleep in the hostel. I also visited the chemist who suggested I see the doctor. Another case of gastroenteritis. Fantastic! I stayed for 3 nights in Ullapool, walked a few laps of the town, watched the hubbub of the port, but mostly I lay in bed. I felt like the creature who inhabited room 7, as other guests arrived they’d peer into my bed, quietly shuffle around and then leave the room. No less than 11 others came and went from that dorm during my stay but I wouldn’t recognise any of them in a line up – their visits too brief and my faculties not all there. I also took the opportunity (the only opportunity for the rest of the trip) to replace my tired boots. I left them in the boot graveyard garden outside the gear shop, thinking that perhaps one day I’ll come back and see them in bloom. By Friday I was more or less eating normally again and was feeling more alert so booked a taxi to take me back to Inverlael on Saturday morning. Today was the day of four glens; Glen Garry, Glen Loyne, Strath Cluanie (pronounced Clooney, like George the door to door coffee salesman) and Glen Affric. So it would be up, down, up, down, up and down again. The morning was also a midge filled nightmare and I only opened the tent at the last moment, already smothered in smidge and adorning my head net. Although after only a minute or so a number of midges had made their way into my head net. This was not the first time and the only explanation I can find is that the holes are not small enough. Grrr, who makes a midge net that midges can penetrate? A very brief stint on the road led to the path up Allt a’ Ghobhainn and up to the first bealach. I could feel the effects of the long day yesterday and struggled a bit going up what was a relatively easy path, although stopping to look back at the view was very rewarding. At the top the River Loyne came into view, my first proper river crossing, and if it was impassable would have to involve a very long detour along the busy A87 – not ideal – so I was a little apprehensive. I descended into the valley along a boggy path and over a stile. That doesn’t sound too arduous does it? Well the stiles round here are monsters, designed for giants, they get you over the 8′ deer fences in 3 easy steps – that’s nearly 3′ per step! For my little legs that’s quite a feat and takes a concerted effort when fully laden. Oh and when I say boggy, I mean boggy. Then it was back up the side of the valley on a pathless stretch alongside a stream to join a track which was the old Skye road. I was relieved to be on more solid ground but after about 20 paces, I shouted ‘boring’! It was about 1.30pm and I was starting to get hunger pangs but was holding out for the Cluanie Inn. It was another 90mins before I arrived and I demolished a burger, washed down with half a pint and then got on my way again. I still had about 6.5miles to go to the hostel. A track leads off the A87 and up Allt a’ Chaorainn Mhoir and peters out after a couple of miles, turning into a quagmire with the path becoming less and less distinct. I lost it briefly and decided to climb to drier ground only to reach a fence with the gate and stile back down the hillside. I begrudgingly trudged down to it and then picked up the path once more. I was getting tired and just wanted to be at the hostel, but my feet had other plans. I lost my footing and took a trip into a bog. With my bag weighing me down I writhed around a bit trying to get back up, so when I eventually stood up I could feel the cold boggy water trickling down my legs under my trousers. Lovely. I grit my teeth, “only 3 miles to go”. When I reached a stream I attempted to rinse some of the bog off me and it was at this point that the midges decided to descend on me. 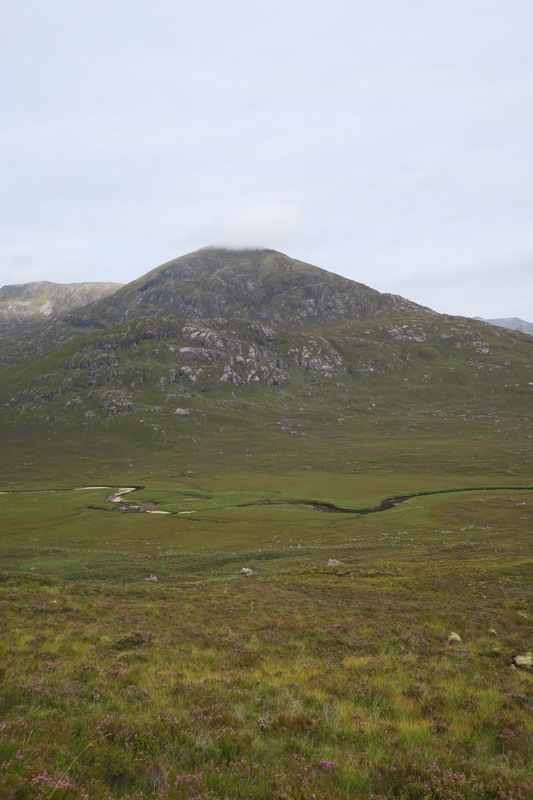 I was tired, bog soaked, the hostel wasn’t yet in view and now midges were gnawing at me. “Whose idea was this?” I shouted and then burst into tears. I took a deep breath, gathered myself together and then pressed on. I would be showered, warm, dry and tucking into dinner within 2 hours. When I arrived at the hostel, I had a very warm and welcoming reception from the warden who offered to put the kettle on the wood burner. The hostel at Glen Affric is very remote, with no track access and no mains services. Hanna the warden lives there 3 weeks on, 1 week off for 6 months, so you feel like she’s welcoming you into her home. 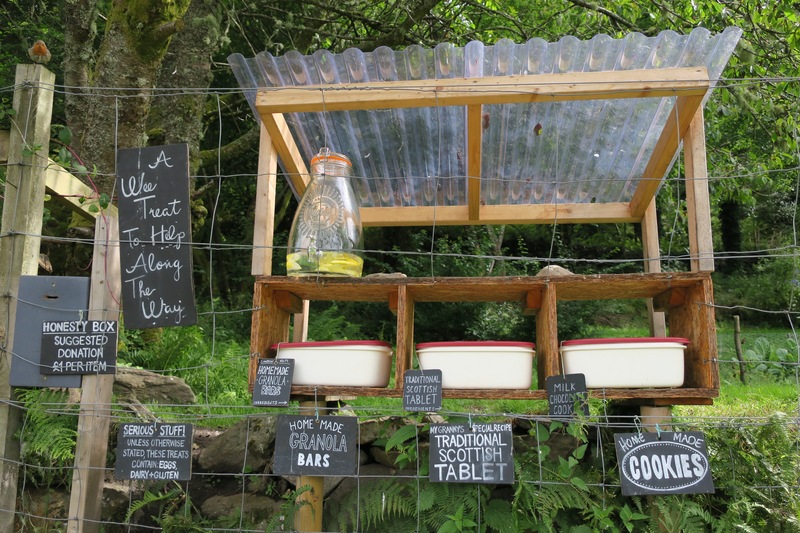 They have a wind turbine and a solar panel which charge a battery for the electricity, the stove heats the common room, the hot water tank for the sinks and shower and dries out wet gear and there is a gas bottle for the hob. And that’s it – no fridge/freezer or electric kettle, the rooms aren’t heated and you can only charge devices if the battery has enough juice. It’s beautifully simple, back to basics living and yet homely and very comfortable. 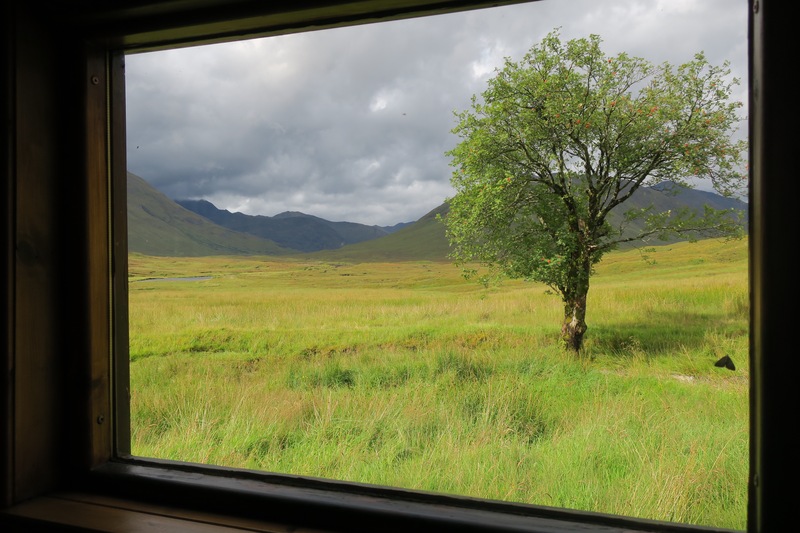 Due to two long tough days and a poor weather forecast – from what we knew – I decided to spend the day enjoying the warm hug of the hostel and the views from the windows. For the whole day it was just me and Hanna, she was touching up some paint work and I did a 1000 piece jigsaw puzzle (Hanna helped a little). More overnight rain led me to listen to Hanna’s and the other hosteller’s advice and avoid my planned route because there were countless streams that would be in spate. Furthermore, I’d learned that my phone had come for the bog swim too and by the process of elimination determined that the charging port was defunct. 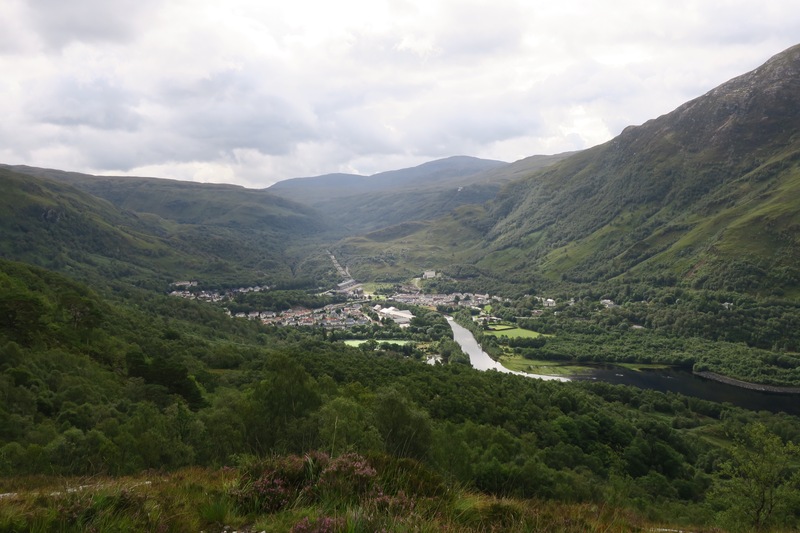 I would head west along the more established Affric Kintail Way to the campsite at Morvich where if necessary I could take a bus to Inverness and it’s Apple store and then head back NE and pick up my route again the next day. The walk was uneventful except for popping into a nice bothy for a wee break and an encounter with a very large bull. I gave it a wide berth but it still stood up and stared at me as if it were imagining how tasty a slice of my chargrilled rump would be. After I’d pitched my tent, I set to work on my phone and after an hour or so it began to charge. 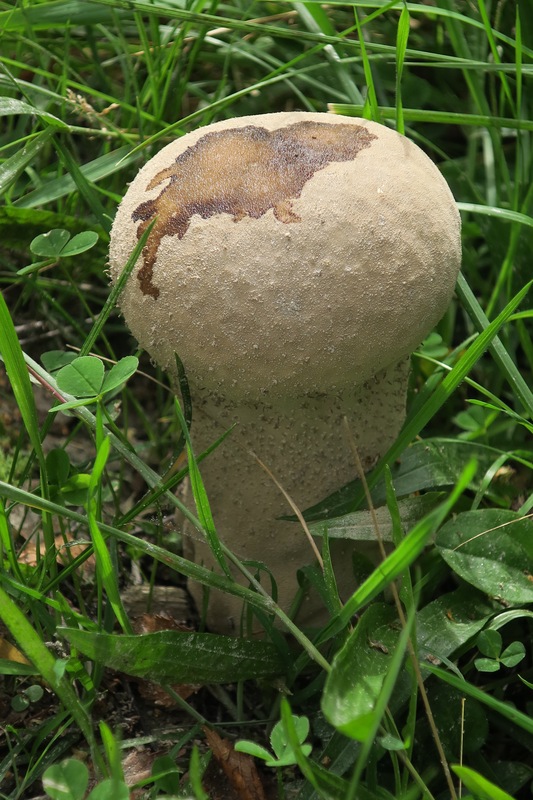 It wasn’t a one-off and it seemed that maybe it was at last drying out. I headed to the lochside restaurant for fish and chips and was treated to a spectacular sunset. 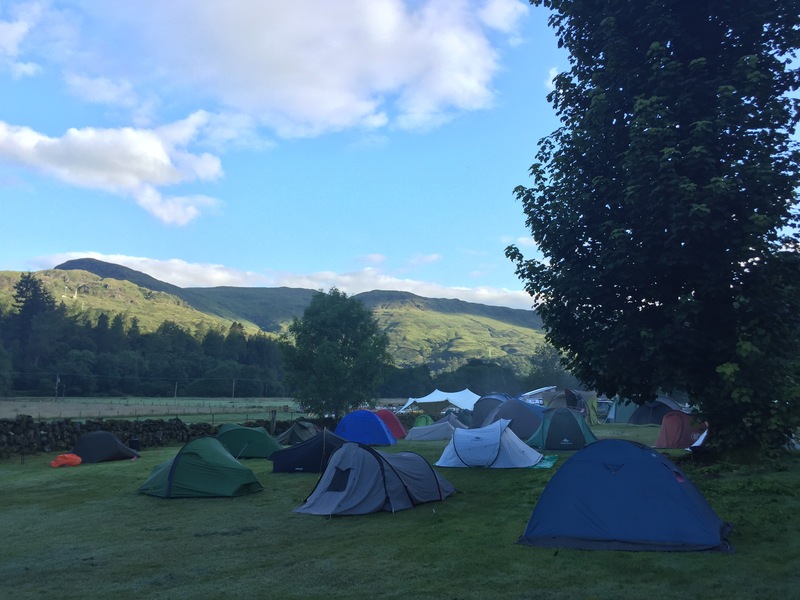 I had a sort of accidental lie in – got distracted by the campsite wifi – and eventually left at 10:30. 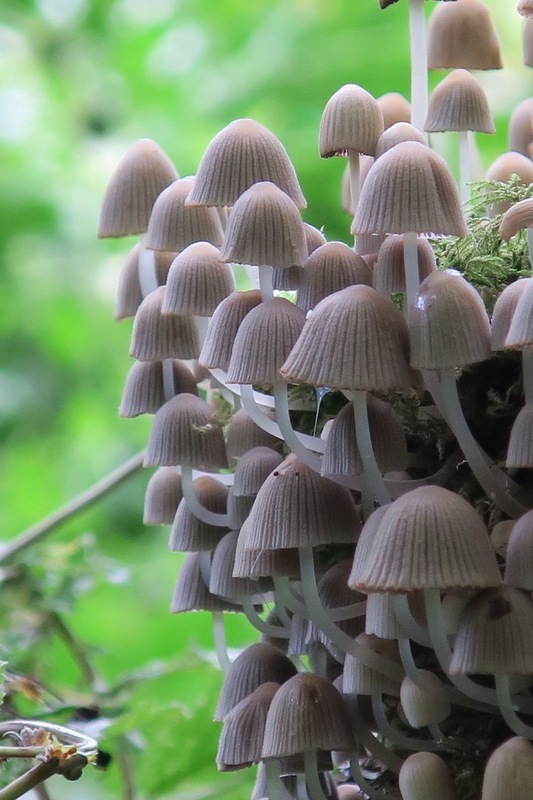 Initially walked up through a forest and there were showers blowing through. It was a long climb up to the bealach where I rejoined the guidebook route at the Falls of Glomach. Right by a big red sign that says “Danger please take great care” I slipped over again, somehow less disastrously this time, but it gave me a bit of a fright as the gorge was deep and rocky. 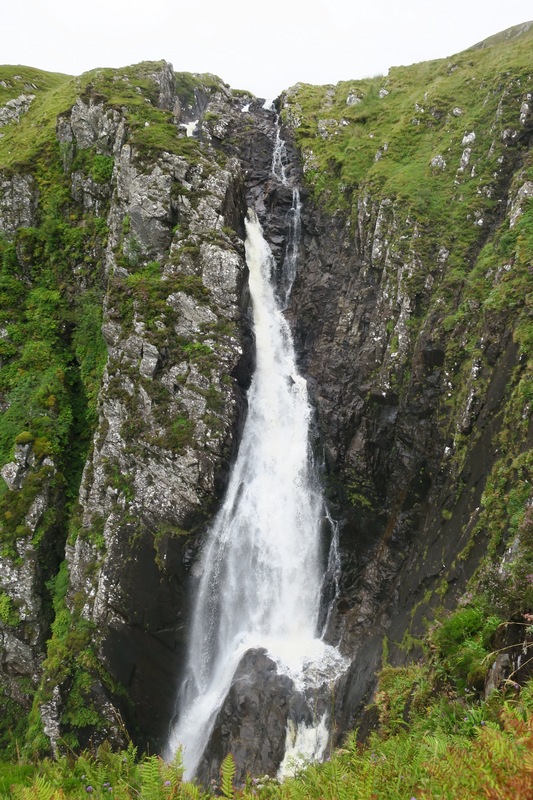 I set off down the wrong precarious path – it’s just a way to get a good view of the falls. I was a bit distracted to really enjoy the waterfall, but it is mightily impressive. I then retraced my steps and set off along the correct precarious path. There were a couple of scary moments scrambling down big, rounded, wet boulders with a fairly sheer drop to one side and on occasion my bag was in the driving seat – as it were. I got to the bottom and heaved a sigh of relief. Having slipped/skidded again I gave myself a good talking too; “concentrate Wood, if you keep slipping like this one of these times it might hurt, a lot”. I then looked at my upturned boots and noticed that they were getting smooth at the front…ah that would explain my frequent slips. I got to a farmstead at Carnach which had some Highland cattle grazing and I was able to sit by Loch an Leitreach while the breeze kept the midges at bay. It was then the last stretch up An Crom-allt over the bealach and down the other side to my destination for the evening; Maol Bhuidhe bothy. Again there were plenty of midges about and so I spent the vast majority of the evening inside. 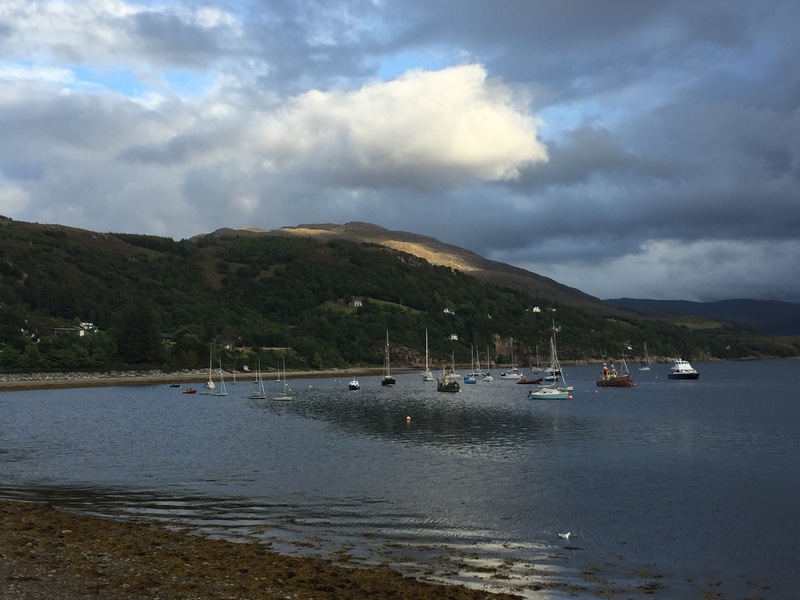 I spent 3 days in Fort William. Throughout planning this trip I was never sure which route I was going to take from there; west coast/central or east coast. 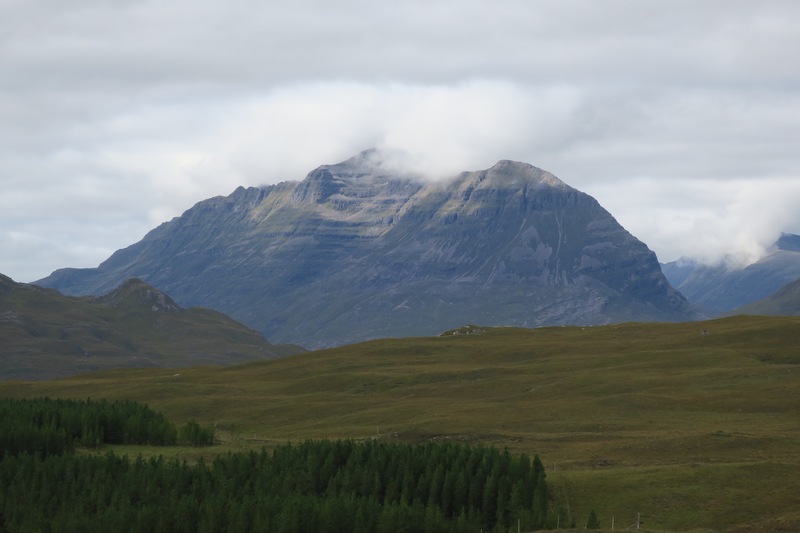 I had gotten a sense over the past few weeks that I wanted to tackle the highlands, plus if I went east there would be a lot of road walking which I think would be an anticlimax. So I had to; purchase the maps and subsequently plan and study the route, plan, purchase, organise and post my food supplies, and purchase and register a personal locator beacon (PLB). It’s an SOS device so that if the proverbial hits the fan and there is no mobile signal, then I can press a button which will send a signal using satellites to the emergency services who then, knowing my location can coordinate a response. It’s like an insurance policy, hopefully I’ll never need to use it but I’ll carry it with me for years to come when out in the hills. So with a 3 week day-by-day plan, a PLB, food parcels posted and some replacement kit for bits that have been worn and torn, I set off on the final stage. Just 250 miles to go, but with the small matter of the highlands standing in my way! The last stage starts surprisingly gently upon the Great Glen Way which leads all the way to Inverness. For the bulk of today I walked along the Caledonian Canal and you probably know by now I dislike towpaths. 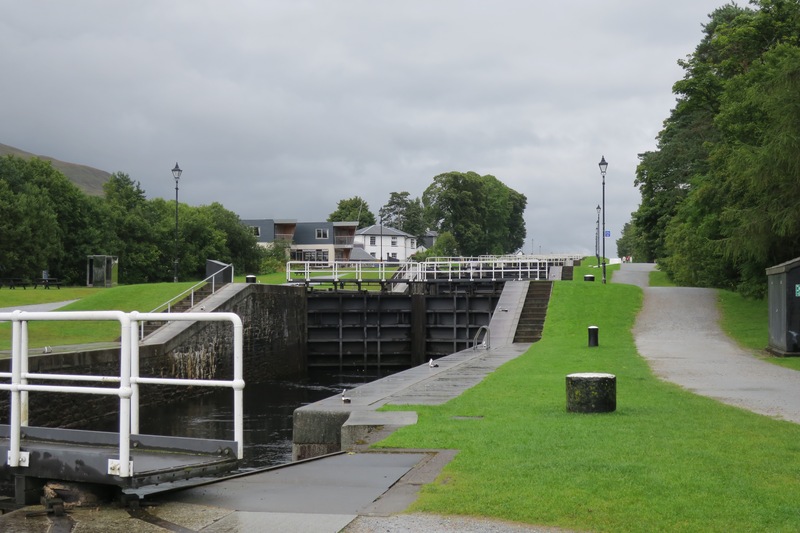 The two features which stuck out were Neptune’s Staircase (a flight of 9 locks) and the Moy bridge (an old swivel bridge, still manually operated). Other than that it was a towpath. The hills on either side were quite spectacular but were often cloud covered or else I was blinkered by my hood, as the showers passed through with high frequency. I reached Gairlochy in good time and paused for thought. 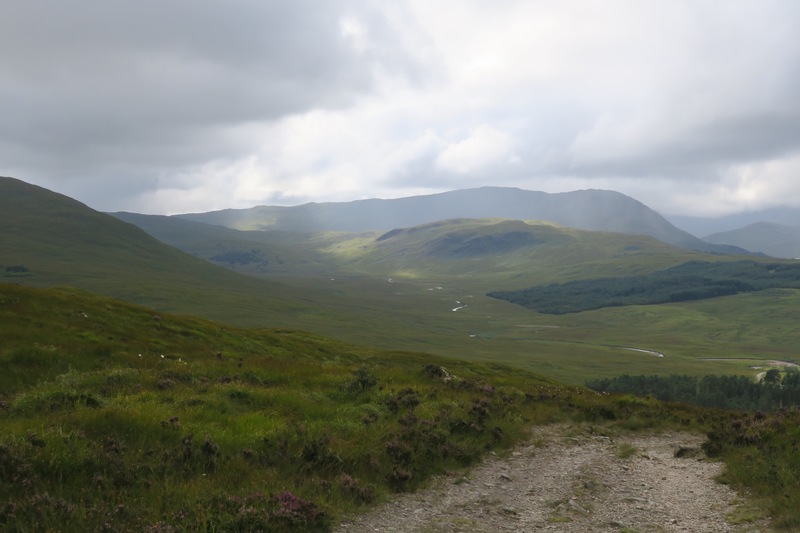 Should I forego the campsite at Gairlochy and continue on for a few miles and wild camp? I decided that as facilities would be scarce over the coming few weeks that I would take the opportunity as it was there. It continued to rain on and off over the course of the evening but there was a brief break in the cloud. On Friday, I woke up nice and early to get cracking on what was due to be a long day (possibly the longest in miles of the trip so far). The rain was hammering down on my tent and after some thought I decided to let the rain pass, I could always walk until quite late, as it stays light until around 10pm up here. By 10:30 the rain had still not passed. A five minute walk up the road I could find a signal and the weather forecast was for persistent rain for the rest of the day and it was due to be worse on Sunday. I was in a quandary as to what to do. I could just ‘woman-up’ and head out into the foul weather, but for my first full day out in the proper hills I would rather not have to battle with the elements too. If I stayed put for the rest of the day and the next I would need to eat into my carefully planned ration packs. The nearest shop was in Spean Bridge – 3 miles away. I decided to stay for the day and the next and so needed food. I started out on the 3 mile walk along the road and after just 100m a lovely old lady who runs a nearby B&B stopped and offered me a lift. She’d already got one of her guests in the passenger seat, and as I learnt, she offers to pick up anyone she sees, even a schizophrenic – much to the concern of her family – but she’s never come to any harm. She said she’d be coming back through in about 4 hours time and if she saw me walking back she’d pick me up. Well unfortunately our return journeys didn’t coincide but as the rain had paused briefly I didn’t mind. So I sat/lay/slept/ate/read/did crosswords/listened to music and listened to the rain pound against my tent for a further 40ish hours. Gairlochy will also go down in my memory as the place where a pair of my knickers went missing from the laundry room, who knows where they’ve gone but it now means I’m a 2 pair lady for the rest of the trip. On the plus side, I guess my bag is slightly lighter. I was frustrated by the delay but by Sunday morning the rain had cleared. I set off towards Glen Garry and I was rewarded for my patience. 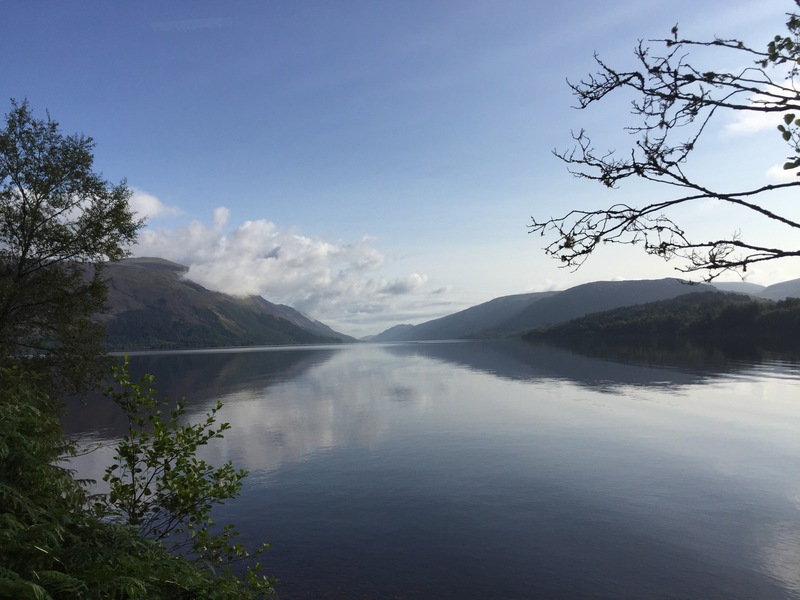 Loch Lochy was like a millpond and the sun shone on the hills which reflected on the waters – it looked more like New Zealand than Blighty. I reached Achnacarry which was the home of the Commando training centre when Churchill commissioned the unit in 1942. They endured the toughest training in all the conditions that the Highlands could throw at them and after 6 weeks they left with their well earned green berets. It’s also the home of the Cameron Clan. Finally, for me it will always be the spot where I reached the 1000 mile mark. “I would walk 500 miles and I would walk 500 more…”. 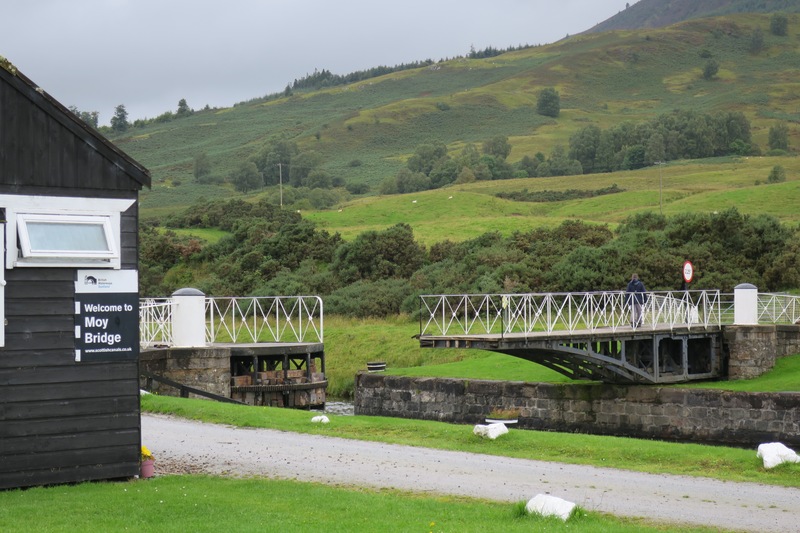 Clan Cameron museum – 1000miles! From Achnacarry the walk took on a very different feel and I didn’t see a single soul until the very end of the day. Firstly was a stiff climb initially alongside some dramatic waterfalls then through felled forestry. 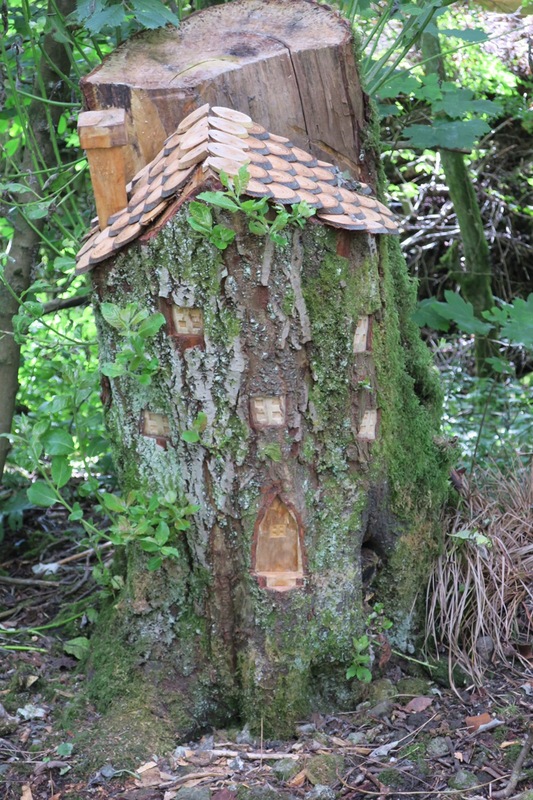 When I reached the end of the forest I stopped for some lunch and midges descended – typical! – so I decided to keep going for a while longer. Further on the situation was no different, so I ate lunch from under a midge net, which is a bit of a challenge. Then was the start of 2.5 miles of pathless peat hags which quickly put my new waterproof socks to the test – which they passed, for the moment. It was tough going but I was feeling triumphant when I reached the end – although the situation on the ground was different from the guidebook. A new fence with an 8 foot locked gate was the first obstacle which was easily climbed and then a torn up landscape lay ahead of me. I eventually found the forestry track and thought that compared to the peat, the rest of the day would be a breeze, how wrong was I! I ended up in a nightmare section of felled trees which made for much harder terrain and the instability of the ground verged on scary. When I got to the road I was tired and my waterproof socks had also given up against the boggy forest (although they eventually failed, they are great and far superior to my regular socks, especially since my boots now sport holes). I was planning to camp about 3 miles down the road but decided that if I found a suitable spot before then I would stop. I was also all out of water and having been fording lovely fresh highland streams all day there was now a lack of them – typical. I was just filling up at a slightly slow roadside brook when a dog walker appeared and made me jump. Seeing where I had just acquired my water from he offered me his tap at home. I took John up on the offer and was soon on my way again. 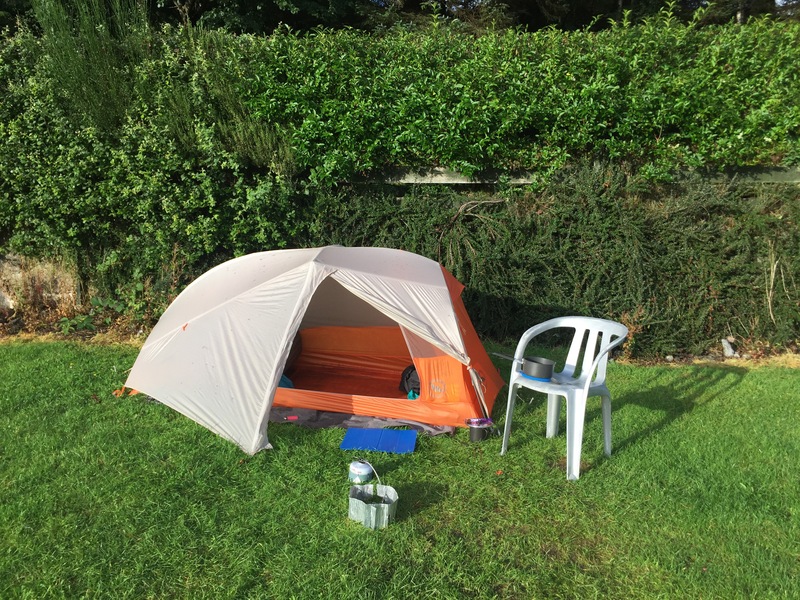 There were no suitable camping areas so I ended up where I had planned and found a fantastic location – the best you’ll get. An area of flat grass overlooking a loch. 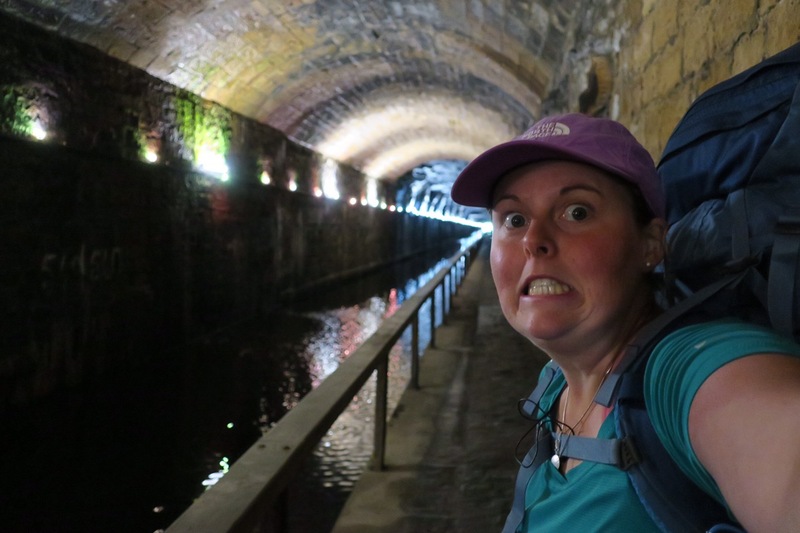 After I’d unloaded my bag a dark cloud descended – it was a cloud of midges. It was like a plague. I turned round and my arm was black. Smidge was applied copiously and the head net went on but neither of which stopped me throwing a continuous paddy. After some chaotic but quick decision making I was in my tent with my rucksack, dinner rehydrating and about 100-200 midges. I spent the next 30mins squishing them all in between mouthfuls of dinner. I waved goodbye to William and headed back out on to the tow path. After a brief rain shower I made it to Kirkintilloch (I had to practice saying that one!) where I had a lovely coffee and brownie just above the canal. I wandered around a bit and stocked up on food, it’s a lovely town and wanted to spend longer there but knew I should keep going. 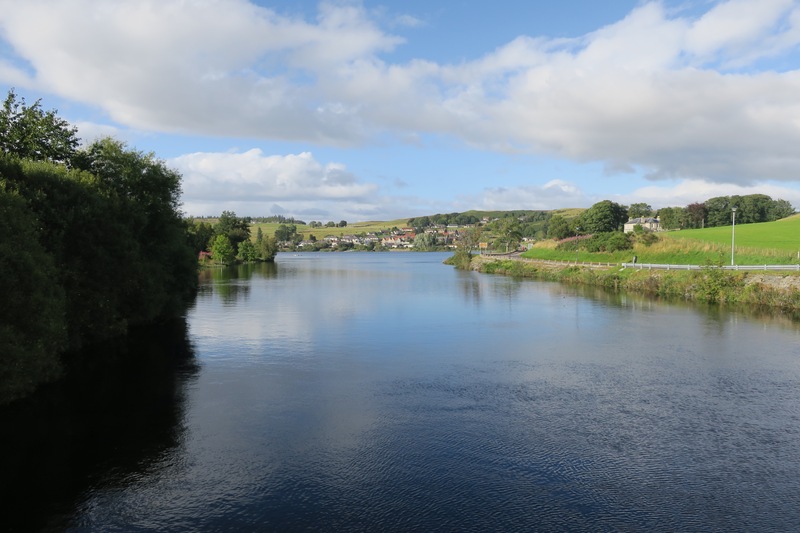 From Kirky (as it’s affectionately known) I left the tow path and took a disused railway line north – I can’t decide which is worse railway line or tow path? I don’t like either. Not a lot happened, there were occasional showers and I walked past the Celtic football club training ground – not visible from the path but I knew it was there. I continued to just short of Strathblane to find a camp spot. On the map I had spotted a rocky mound called Dunglass Rock and I was excited to see that it lived up to my expectations. 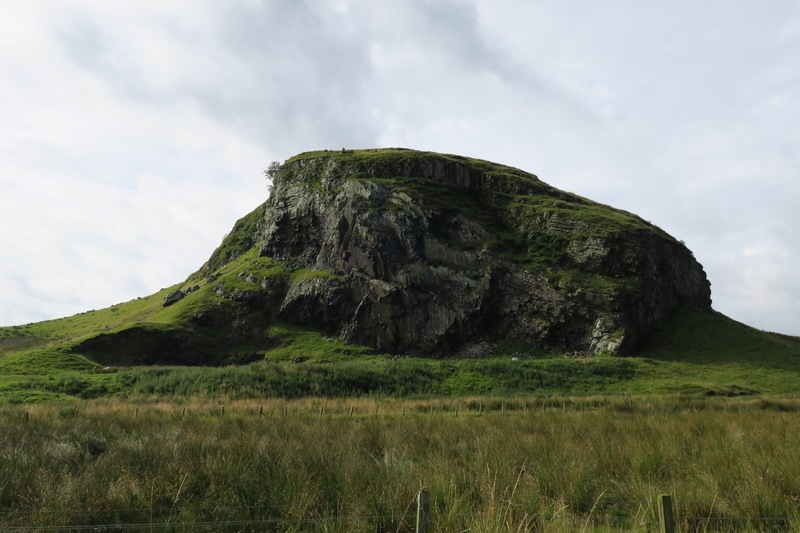 It was a 50m high rocky protrusion but with a gradual slope to the rear and a nice flat grassy top – perfect for wild camping. The only snag was the cows and sheep that were allowed to roam over it. I headed to the summit and concluded that the cows rarely visit the top – there were distinctly fewer cow pats up there. It was still early so I just relaxed and waited for the wind to die down as it was forecast to. I watched the attractive sunset and then dived into bed. It turned out that the cows and calves do come quite close to the top of the rock but luckily they kept their distance to about 10m and didn’t disturb me. I think I’ve cracked my fear. I left my temporary kingdom behind and passed through Strathblane. It was in the village somewhere that I think was the source of the fireworks that I could hear but not see late last night which gave me a temporary fright! I was still on a disused railway but it’s not marked as a footpath and so was overgrown – I had flashbacks to parts of Somerset and Shropshire where I had to bash my way through footpaths. I decided to take a parallel track but it led to the private grounds of a castle so I ended up scrambling up the embankment and over a barbed wire fence to pick up the railway line again. It was very damp and no sign of anyone just lots of deer tracks. 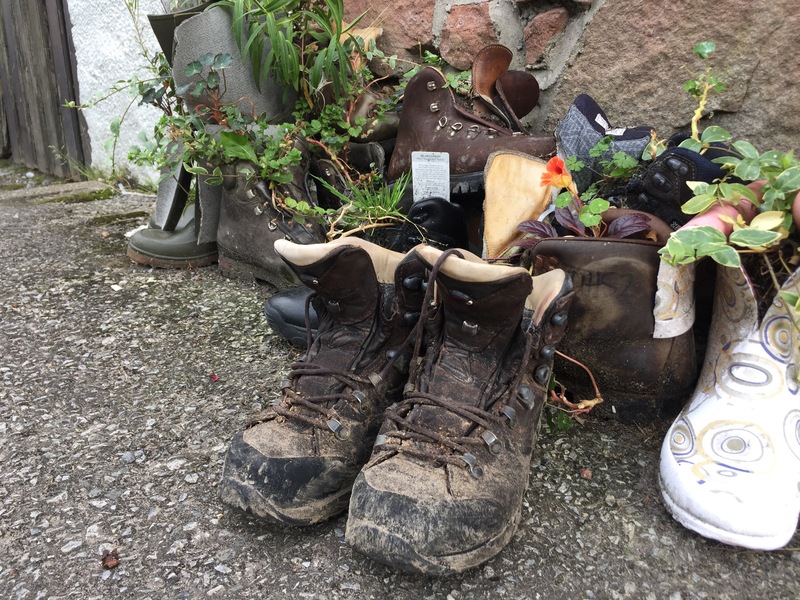 That was until the West Highland Way (WHW) joined the track and all of a sudden I was on the footpath equivalent of a motorway – a constant stream of walkers with backpacks. It was weird. I think I said hello to every single one! Early on I met Susanne, a German nursery school teacher who was here to walk the WHW and then the Great Glen Way to Inverness – I would bump into her a few more times. I headed to the Drymen Inn for dinner and enjoyed the live music – there was a great atmosphere. He even sang the Proclaimers – I Would Walk 500 Miles, how appropriate?! Although it should be 900, as that’s how many miles I’ve now walked. Whoop! 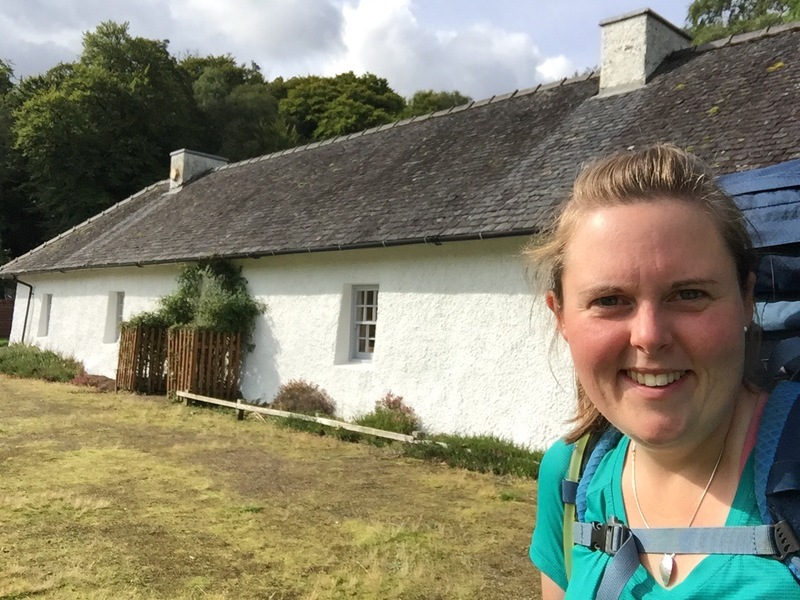 I left Drymen with Florina – a Romanian cardiologist – who arrived on holiday in Glasgow a couple of days ago and having not done any hiking before decided there and then to do the WHW – as you do! Frances had helped her out with booking accommodation but it wasn’t available all the way, so lent Florina a tent and sleeping bag. She was using a baggage transfer company and would be able to send them back to Frances via them. We set off through the forest and then up Conic Hill (my first hill for over a week) where Loch Lomond comes into full view – and it is stunning. There are so many islands poking out from the deep waters and they look like little paradise havens. It’s just a bit of a shame to be sharing the experience with literally hundreds probably thousands of others. 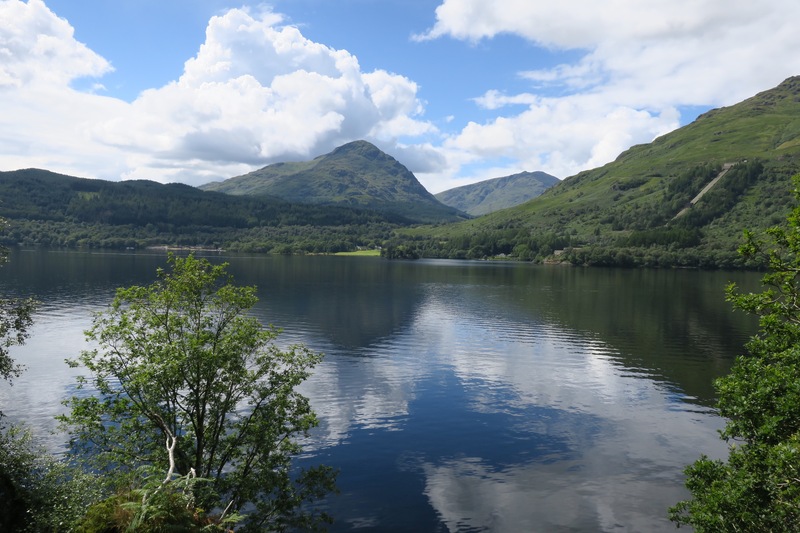 We spent the rest of the day walking along the eastern shore of Loch Lomond – I introduced Florina to the song the Bonnie Banks of Loch Lomond and had it stuck in my head for the rest of the day. We arrived in Rowardennan late on, I said goodbye to Florina, she was staying elsewhere, but we thought we’d see each other again. 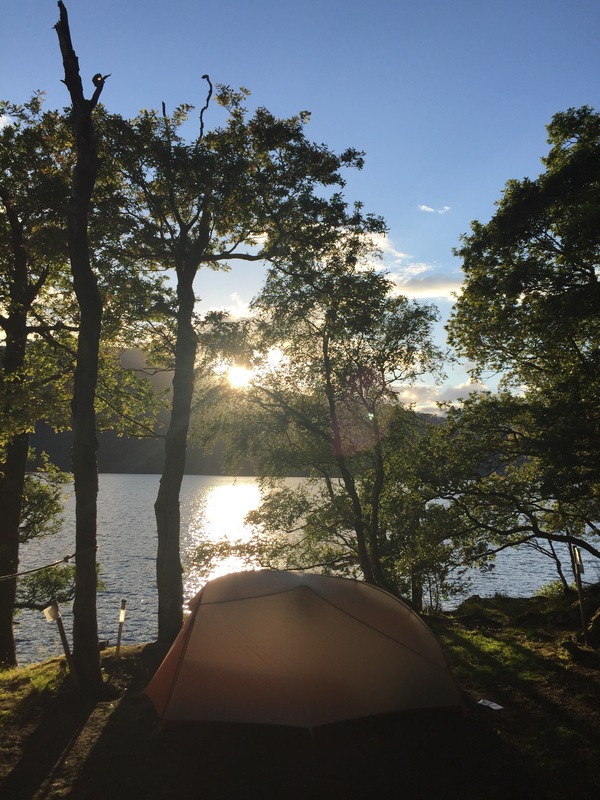 I quickly pitched my tent at the youth hostel, with a stunning Loch side view, showered and then had dinner with Luca and Rafaella. The WHW is turning into a bit of a whirlwind; so many people to talk to and such lovely scenery to appreciate but so little time to sit and reflect. I’m used to having so much thinking space that I’m finding it difficult to adjust, but rather than resist I’m just going to ride the West Highland wave. 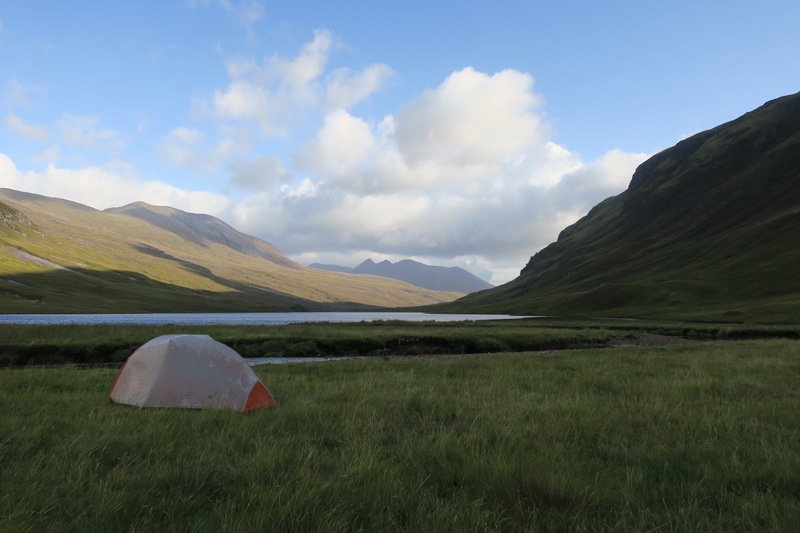 I rapidly packed up amongst the midges – the catch when camping by a beautiful loch. The little blighters are noticeably increasing in number. This was expected but doesn’t make them any less annoying. Without signal, I couldn’t arrange to walk with Florina but knew we’d see each other at the campsite in Inverarnan. 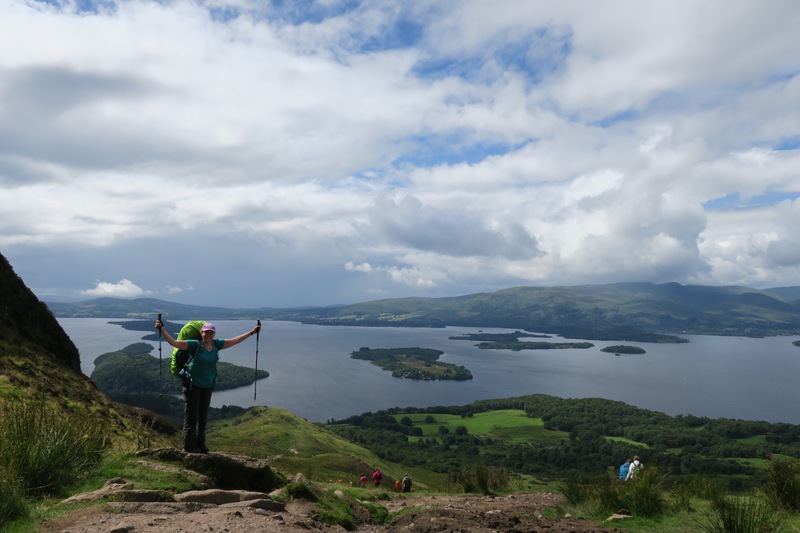 Today’s stretch is widely accepted as the hardest day on the WHW as the path rises, falls and winds its way along the rest of Loch Lomond. It’s quite rocky, tree roots are tangled up amongst the path, there are numerous brooks to cross and the day ends with a short climb and fall to Beinglas Farm. 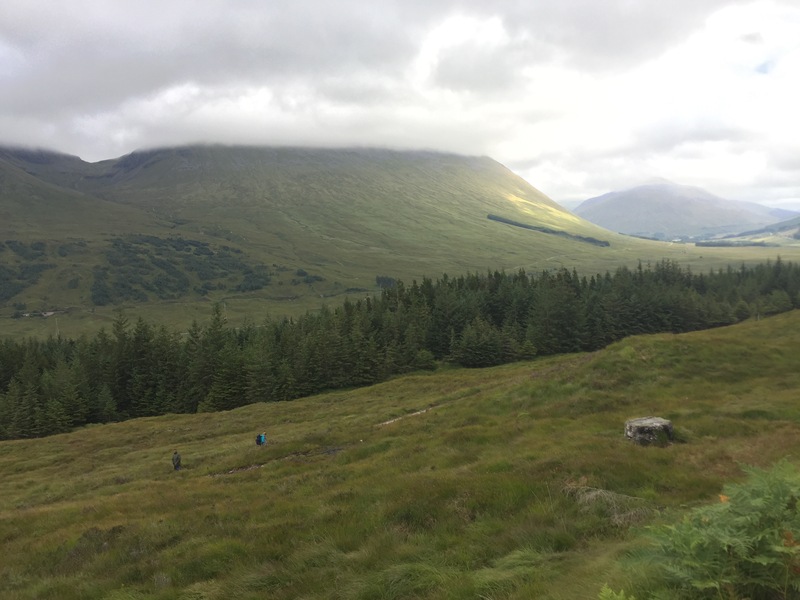 As I approached the halfway mark – Inversnaid – I met a couple coming my way who’d just managed to get their double pram down a flight of stone steps (luckily the children were old enough to walk and were doing so). 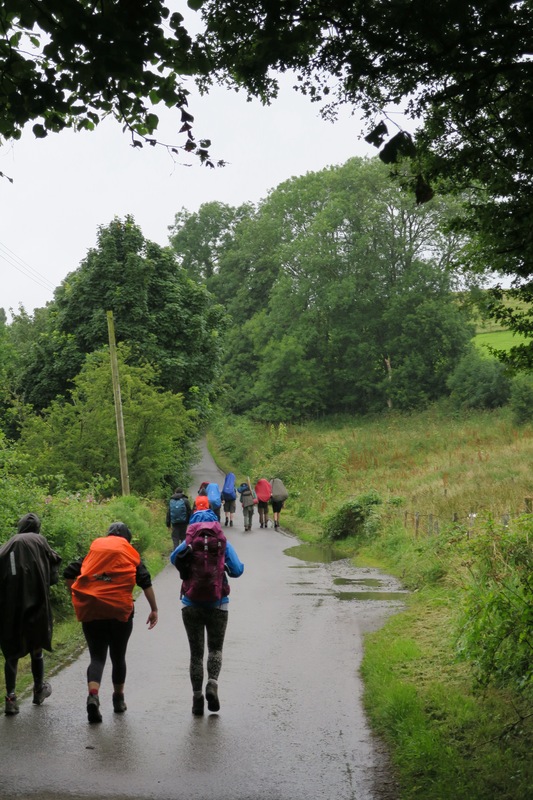 I thought I’d do the right thing and let them know how much narrower, trickier and down right difficult it was going to get for them to take a pushchair along the route – they were planning to do the full 7 miles! They insisted that they were capable, they’d ‘done crazy stuff like this before’, so I shrugged my shoulders and let them pass by. I would like to know how they got on. I bumped into Susanne at Inversnaid and so we had lunch together. In the afternoon the frequency of rain showers increased and by about 4pm I was drenched. The Doune Byre(?) bothy despite its disgusting state was useful to get some respite and dry off a little. I was approaching the lively Beinglass campsite and had more or less dried out but with just 100m to go the heavens opened so I made a run for it. 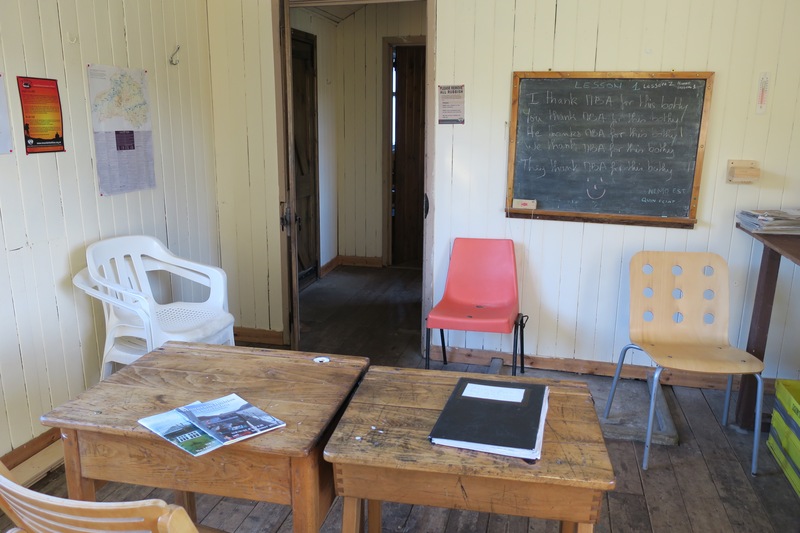 I ducked under the first cover – an information board with a little roof, and was soon sharing it with about 10 German children. It was a very tight squeeze! As the rain was petering out I headed for the bar, beer always helps. 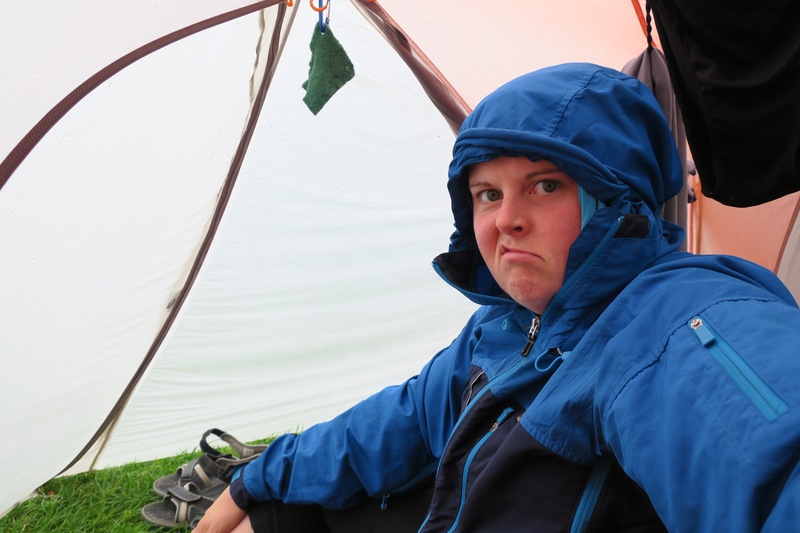 By the time I dragged myself away from the bar and had begun to pitch my tent the next rain cloud had rolled in. The field at this point was becoming saturated and the field was rather full so it was hard to find a suitable pitch. At this point Florina arrived and we hurriedly pitched her tent in the rain and off we went back to the bar for dinner. 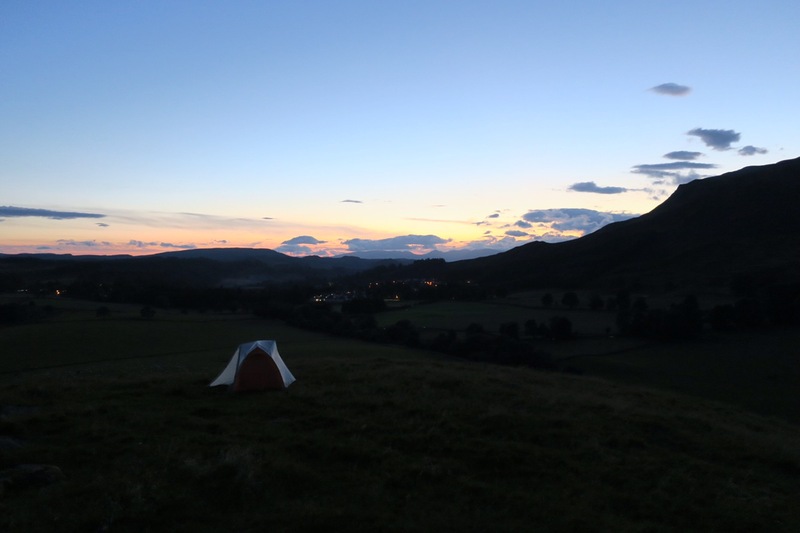 After 1 too many drinks, I returned to my tent to find that in the chaos I’d left my fly sheet unzipped and my tent now had a medium-sized colony of midges – I squished every single one before going to sleep. I already had enough itchy bites to scratch. After more overnight rain the field was most positively a quagmire – with the foot traffic it was starting to get muddy. It was another midge filled morning so I was very grateful for my head net which I bought a few weeks ago. With Florina’s tent packed up we headed off and left the bustling site behind. The path rose and fell through a much more open landscape this time and I was finding that conversation overtook my understanding and appreciation of the vistas. 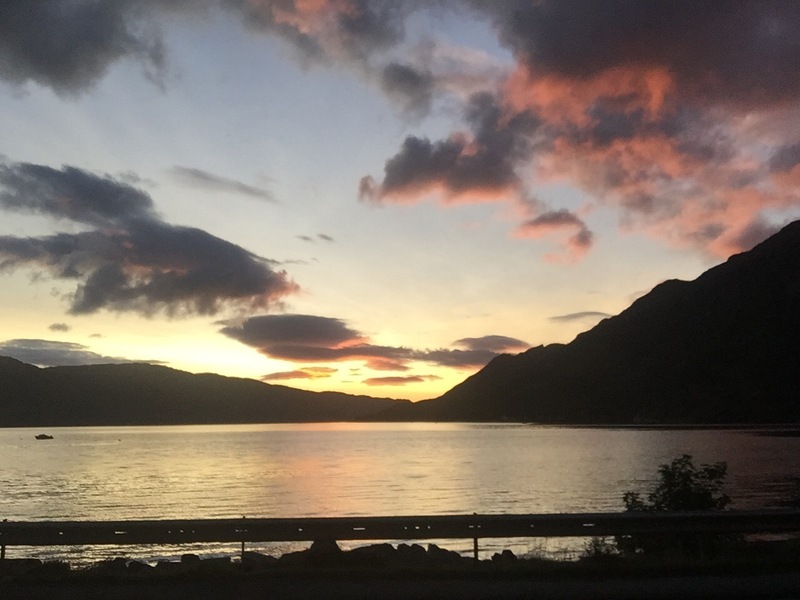 It nagged me a little but I knew that north of Fort William the views would be even more spectacular, I’d have the place to myself and all the time in the world to appreciate them, so for the moment I would relish the company as opposed to the scenery. We were trying to keep up a decent pace as Florina needed to cover more miles than me today. We took a break for some lunch where we met some fellow walkers. One guy was wearing jeans (yes jeans, on the WHW) and had fashioned himself a pair of gaffa tape socks in an attempt to keep his feet dry as his trainers weren’t doing the job (yes trainers – and fashion trainers at that, not trail or approach shoes). It beggars belief. 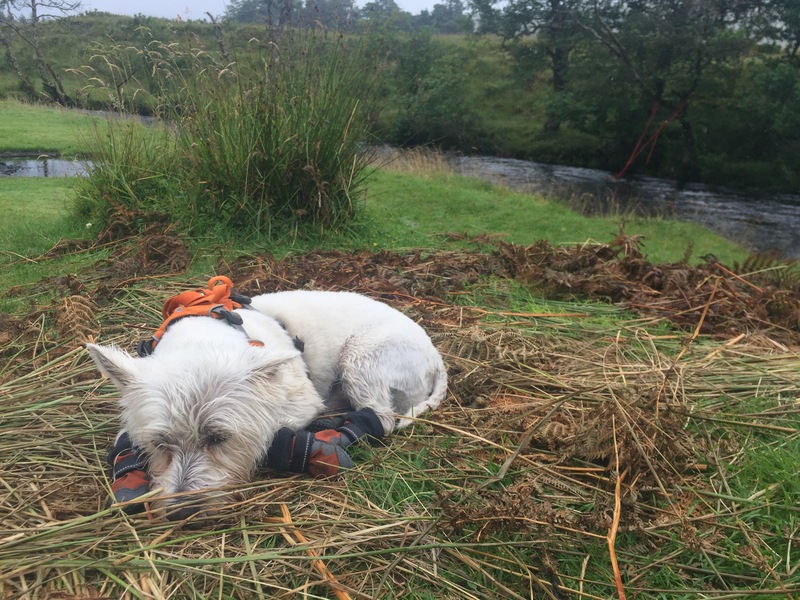 There was also a girl there with her dog Dougal a cute Westie terrier, on the WHW, whatever next?! 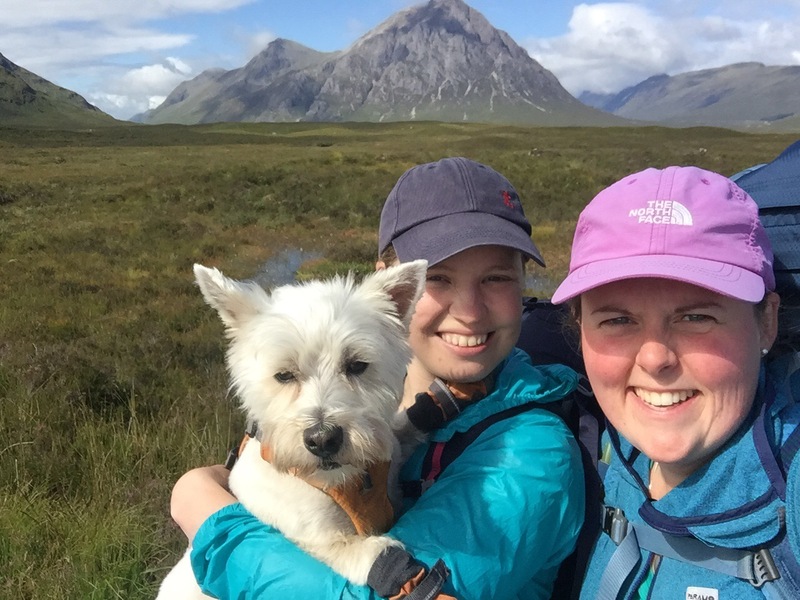 As we all got up to leave, the girl with the dog – Rawnie (pronounced Row-knee) looked to be in some discomfort which she put down to numerous bad blisters and a potentially infected one. Florina’s doctoring instinct took over and she persuaded Rawnie to take the bandages off to let her get a good look. It was clearly exceedingly painful but without sterile equipment or surfaces there wasn’t a lot of treatment she could give. 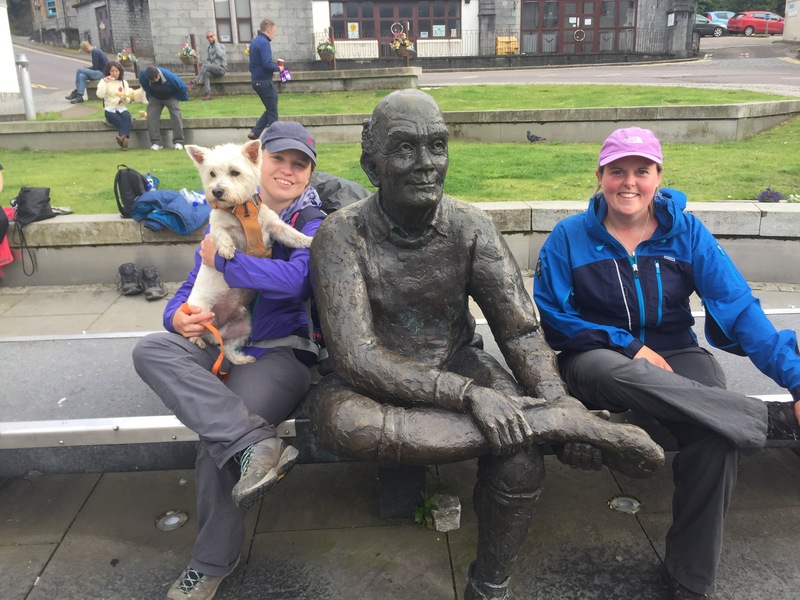 She gave Rawnie some advice including; perhaps not walking the rest of the way to Fort William and going to get the blisters seen to by a nurse. Once she was back on her feet Florina and I said goodbye as we had to dash. 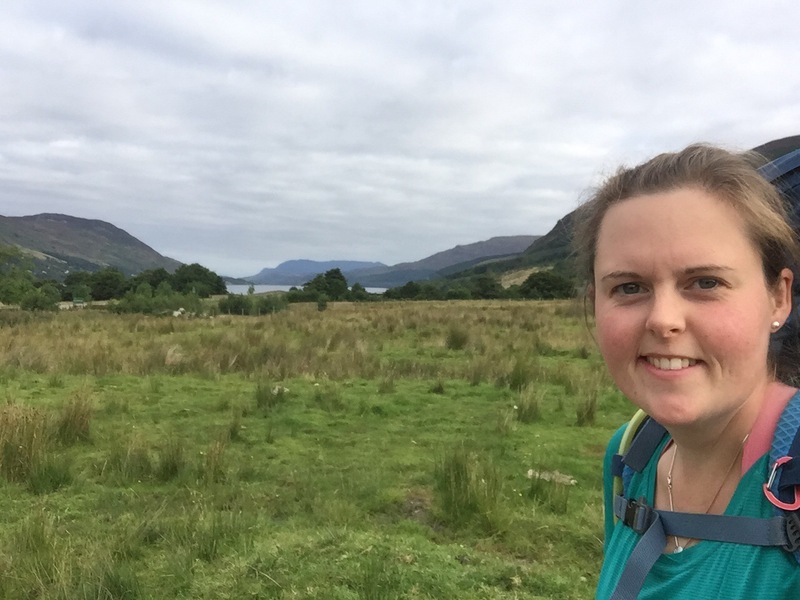 We arrived at Tyndrum at around 16:30 and headed straight to the Real Food Cafe so Florina could get a substantial meal, she still had about 3 hours walking to do. We exchanged numbers and parted ways, she said I’d be welcome in Bucharest any time. When I turned up at the campsite I found Rawnie hobbling around and we got chatting some more. She had found 2 others that she’d met earlier in the trip – Akshay and Sophie, so the four of us went out for fish and chips at the cafe. 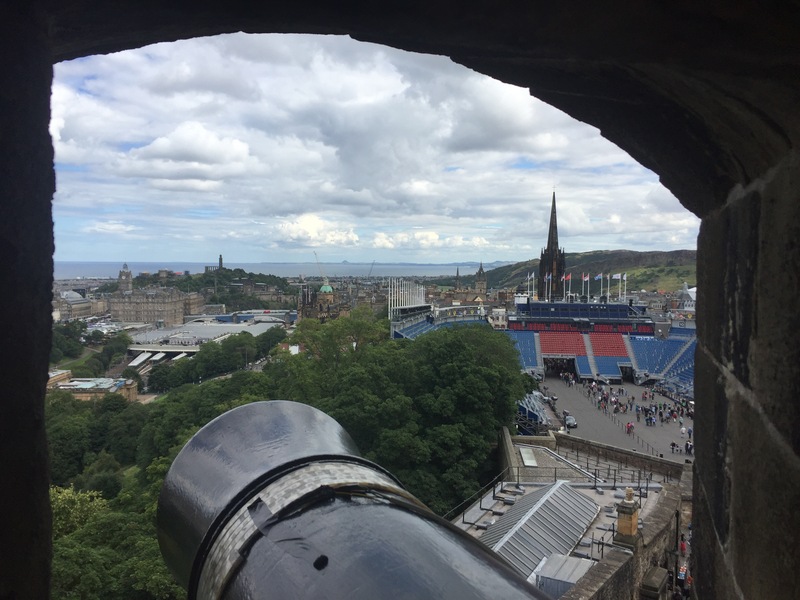 I spent 4 nights in Edinburgh. 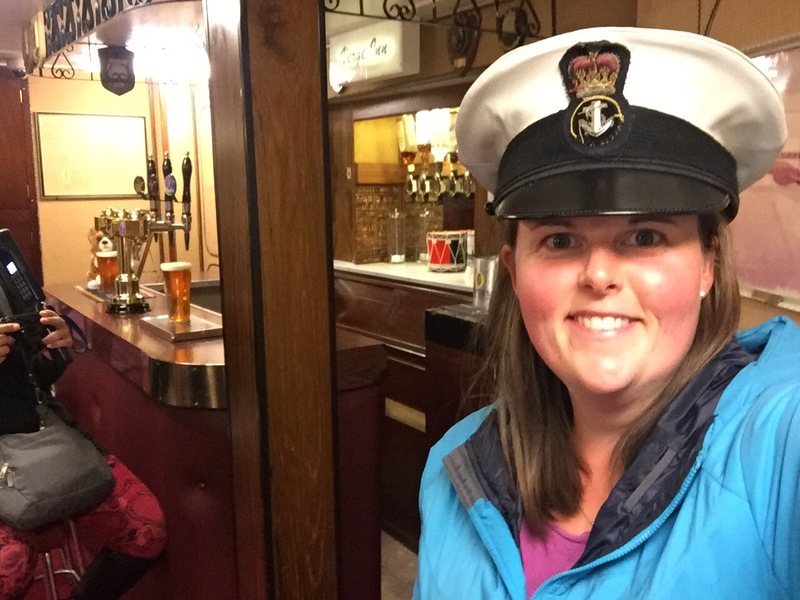 I did a sightseeing bus tour, I walked around the castle, the Royal Yacht Britannia, caught up on my blog, generally soaked up the atmosphere and did a bit of shopping. It’s almost impossible to rest in a city. I also saw a podiatrist who diagnosed me with sesamoiditis. Possibly damage to or a stress fracture of one of my sesamoid bones (a tiny bone under the big toe joint). In an ideal world, after 6 weeks of complete rest it should be healed but she knew I’d like to carry on so attached some specific padding to my insoles and advised that I take anti-inflammatories. She also said that if it gets significantly worse that I should stop because continuing in agony could lead to longer term consequences. I’m hoping that the padding does the trick and I can carry on, as having to stop now would be devastating. I also treated myself to a sports massage and the guy did a fantastic job of ironing out my stiff, tired legs and knotty shoulders. Edinburgh has been interesting, but busy. So busy. It’s peak season, on the cusp of the fringe festival and tourists of all nationalities wander the streets. It’s been a bit of a shock to the system; the traffic, the choice (of one sort or another), the sirens and just the sheer scale. The biggest place I’ve been since I left was – I think – Barnstaple which is not exactly huge and was a long time ago. I’m looking forward to getting back out on the trail but a bit apprehensive about how my right foot will cope. After some morning faff I eventually got on a train out of Edinburgh at 10am. No less than 2 minutes after stepping off the train it started raining – just a brief shower and then 10 minutes later it was stair-rods. Luckily there were some strategically placed trees and I kept out of the worst of it and then stayed dry for the rest of the day. I walked along the Union Canal all day, sometimes there was a rural view (a horse that had moments earlier given birth to a black foal) and other times very urban (a young offenders institute). 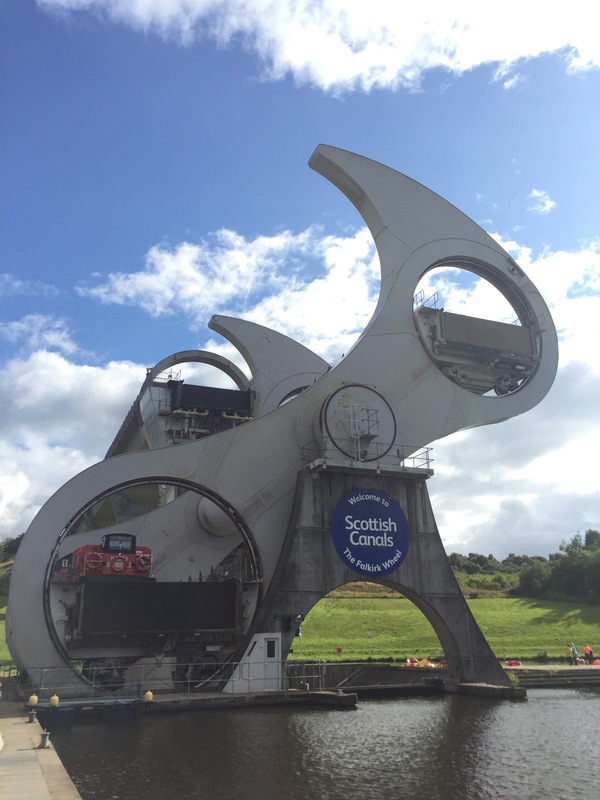 The two highlights were the Falkirk Tunnel and the Falkirk Wheel. 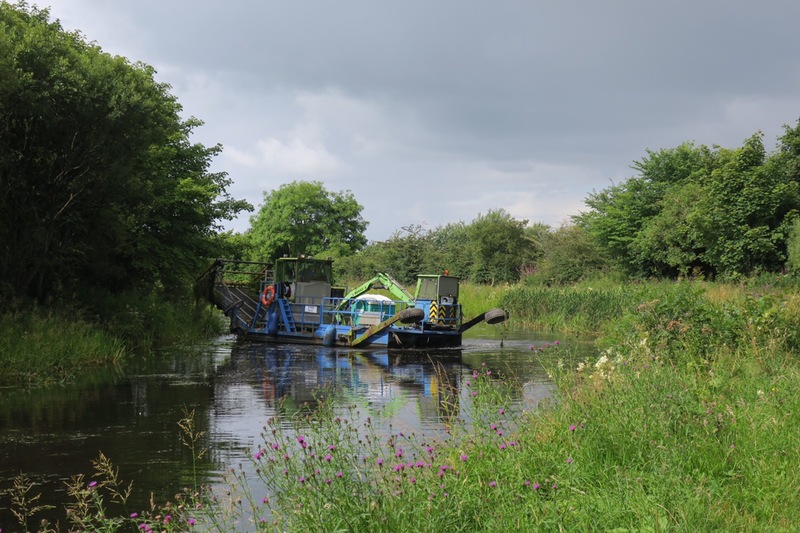 It’s 636m in length and was dug because the local landowner didn’t want the canal to spoil his view and so demanded the canal go through the hill. It was quite drippy and eerie in parts, but lit just enough. The wheel, in contrast to a crude hole through a rock, is a feat of modern simplistic engineering. It replaced a set of 11 locks that had fallen into disuse and were dismantled 70years previously. There is something mesmerising about its elegance and many people stand rooted to the spot watching it rotate. My foot has been ok, I don’t feel like the padding is a panacea but I find tow paths quite hard going anyway so it’s an unfair expectation. Not just because of the hard surface impacting my feet and knees but also the lack of variability of movement in the feet and leg muscles. Even without any issues I find it hard not to become conscious of my gait because of the monotony. I’m looking forward to getting off the tow path (2 more days!) and seeing how I fare on a more irregular path. I started slowly and the day continued in the same vein. I would walk for a while, stop, take my boots off, rest, then back on with the boots and away again. This being the first time on the trip that I’ve been properly suffering physically has knocked me for six a bit. I was expecting that if I made it this far that I’d be a walking machine and that it would only take something major like a fall or bad sprain that would stop me getting to the end. Instead I have niggles that dominate my thoughts and stop it from being fun – that and sodding tow paths. Enough of my down beat drawl. Today had a distinct second chapter. After a nice beer at a hotel by a marina I continued the 1.5miles to the campsite. When I arrived it was locked up and didn’t turn out to be a touring site – it was an adventure/activity centre which also offered camping. I gave the number a ring and left a voicemail but didn’t hold out much hope. So I started to consider the alternatives. No other campsites and according to research no B&Bs. There was a potential wild camping spot but I was out of water and there were no streams around, just a stagnant canal. I walked just 100m and there was a B&B sign hanging outside a farm, so I thought I’d give it a shot. A lovely Scots lady answered the door and unfortunately they had no vacancies. Could I camp? Without a moment of hesitation she said; “aye, roond tha back”. Within 2 minutes of pitching my tent on a lovely lawn I was presented with 2 fresh eggs from the hens that were now pecking at my bag. And just 10 minutes later I was offered a bowl of steaming hot soup and 2 slices of garlic bread. Oh how the tide can turn so quickly. William and Elizabeth’s generosity was so heart warming – as was the soup! I tried to offer them some money but they wouldn’t take it.